9,212m / 30,223ft. That’s the amount of vertical distance my legs carried me over a period of just over 1 week out in BC. 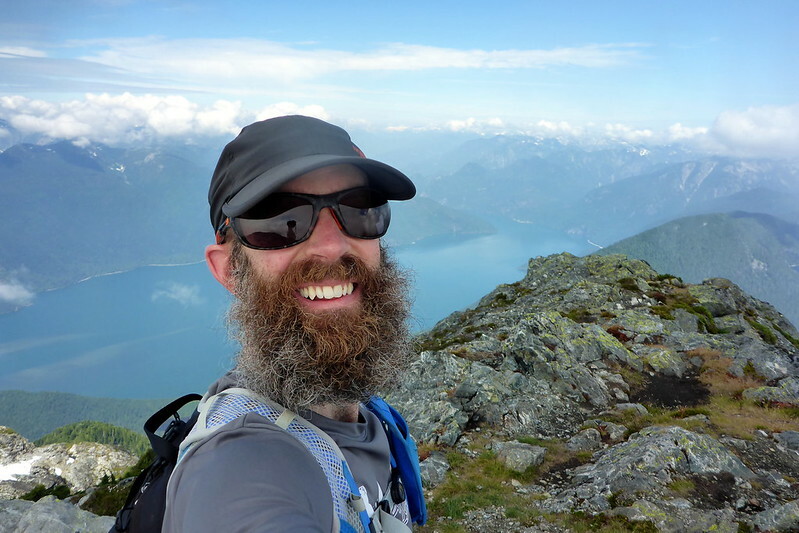 This included a back-to-back 2 days of racing in the Squamish 50/50 event at the END of the trip, and a bunch of great hiking and running outings in the days leading up to the event. Perhaps not the exact prescription for a proper taper, but when I’m surrounded by mountains, and have time to take advantage of it, I do! Even better than that was the fact that I was sharing all the experiences with Deanna, who not only joined in on the hikes, but was tackling her first-ever 50 miler!! She didn’t exactly choose the easiest one to cut her teeth on, so it was going to be an interesting experience. Read on to hear all about our races. Before we get into the meat of the race report, I wanted to take some time to write a post about the vacation part of the trip. Canada is an immense and beautiful country, and there are so many amazing places to visit. It will come as no surprise that being surrounded by mountains, the ocean, and lush forests, BC, and even just the areas around Vancouver, truly captivated me. More than once I imagined myself living there and being able to play in the surrounding trails all the time. On this trip, we at least got to experience a good cross-section of the adventuring opportunities around these parts, so read on to learn more about those adventures. 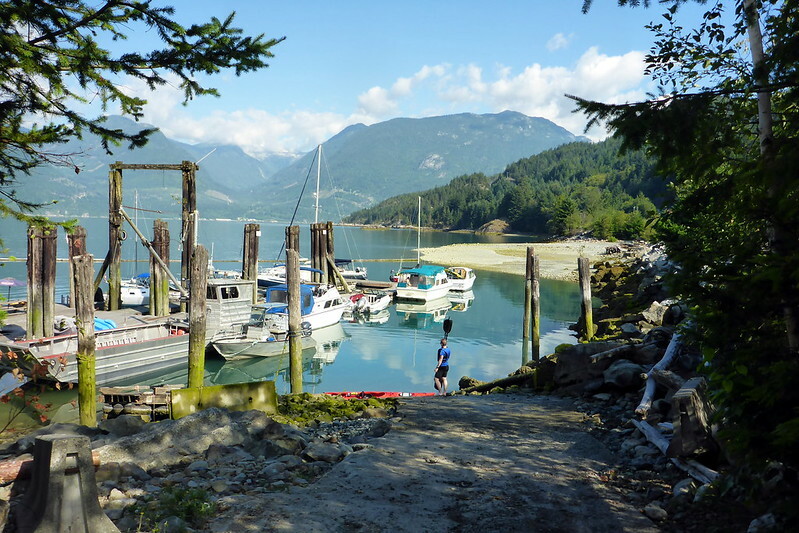 While at the Sinister 7 I only gave my self a glorified long weekend for the endeavour, with Deanna joining me for Squamish 50, we made it a 10-day vacation giving us time to explore what is essentially the Greater Vancouver areas as far as Whistler. We’d originally had plans to make a huge car journey all the way into the Rockies, but given the ongoing wildfires, and the how long the drive might take, we instead opted to only venture a few hours in any direction from Vancouver. Fresh off the plan on a Saturday, we decided to grab the rental car and head straight to Grouse Mountain to tackle the Grouse Grind, because, well, why not? An 800m vertical climb over a short distance was the perfect way to shake out the legs after a long flight. Our only stop was at a convenience to grab granola bars and nuts as a snack. I’ve gotta say, the Grind was really cool There are some impressively steep sections, and it really would be a challenge to run that trail. Ultimately, at a brisk hiking pace, my time was about 1 hour. I figured that with a real effort, I could break 40 minutes. At the top, we enjoyed the world famous Lumberjack Show, hiking trails, and the Grouse Grizzlies. To cap it off, cold beers on the observation deck watching the Vancouver Harbour far off below. Great introduction to the West Coast life. 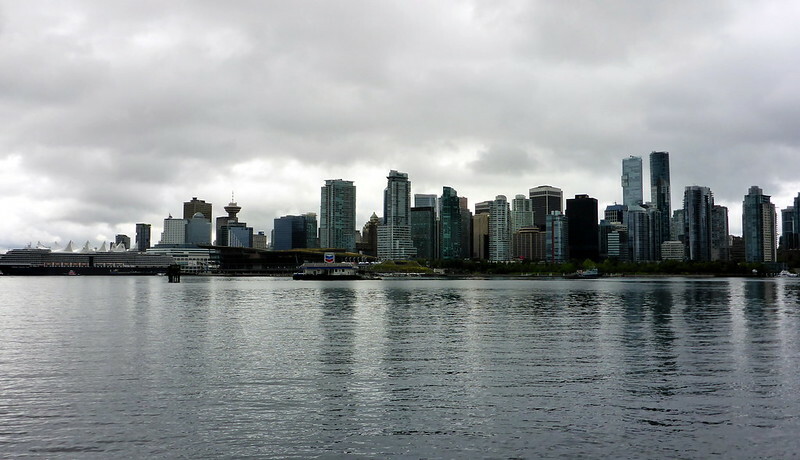 The next morning, we got out of bed relatively early to make our way to the Sea Bus and head into downtown Vancouver. Destination? A bike rental store of course! 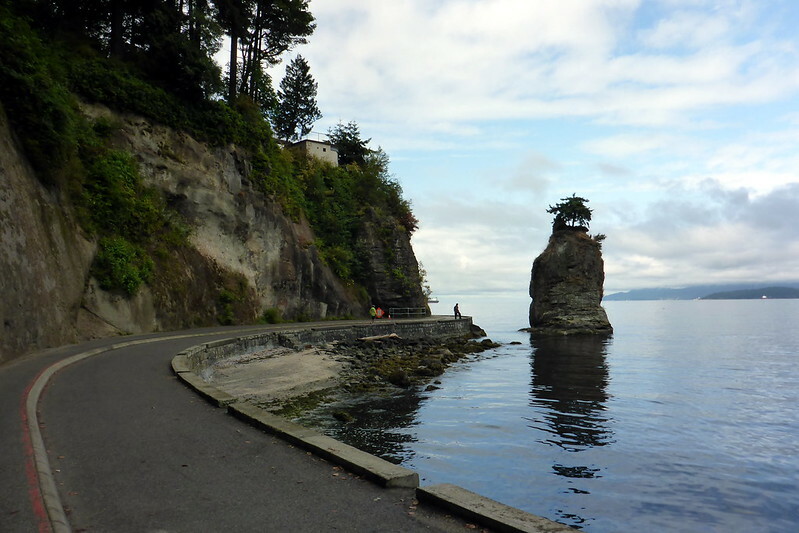 The plan was to cycle all around the city and take in the sights and the suds of Vancouver. This included a great little ride on the trails of Stanley Park before making our way to Granville Island to explore and have our first brewery stop where we also had lunch. Afterwards, more cycling and awesome beer tastings at other breweries. My only regret was that we could hit them all! This was likely the worst weather of our whole trip, and even then wasn’t bad. Slightly chilly, with a little bit of rain early in the day, but all in all great conditions for a day of bumming around on bikes. After our two days of exploring Vancouver, it was time to get a little further from civilization. We’d managed to borrow a tent and cooler from our friends in North Vancouver that we had been staying with, so we packed up our mighty little rental car and made our way 2 hours away to Golden Ears Park. While only 2 hours by car, it might as well have been 20 hours. Once in the park, we were surrounded only by gorgeous mountains and forests, and had no cell signal. Perfect! Of course, it was car camping, so there were others not far from us, but we had a spacious site, so we definitely felt like we were in the zone. We had 2 nights booked here, and due to our slightly late start, opted to explore shorter hikes on day 1. I pored over a few maps before settling on a trail that would lead us up a canyon and ultimately lead us to a remote rocky beach with great views and some waterfalls. HOWEVER, as we hiked on the wide, gravel ‘trail’, I was a bit wistful, as it felt too civilized. Then, out of the corner of my eye, I spotted a little trail sign to our right heading up a steep faint trail labelled ‘difficult’. I somehow convinced Deanna it would be a good idea to head that way, even though we had no map or idea where it went. But when the direction is up, it always looks good to me! After fighting and scrambling our way up this really cool back-country trail, we eventually arrived at a little pond higher up. I consulted the topos I had on my GPS, and figured that the trail kept going a LOT higher up to a summit. However, we were ill-equipped, and that would have been a bit more than the ‘forest hike’ I”d promised Deanna. Reluctantly, I turned back and we headed back down, and followed the original trail to the sights I had planned. They were still very much worth it, and little did I know just how much the next day would make up for it! Day 2 at Golden Ears we got up early for breakfast, since we were going to tackle the Golden Ears Summit trail, whcih headed up to amazing vistas of the entire region. We decided to make this a bit of a training run, and geared up with running backs and gear. We set out at a good ‘ultra’ pace, making our way along the early parts of the trail in good time, as it wasn’t too steep yet. There was a lot of climbing to be done, but it was back-weighted, with the final push including the steepest sections. Unfortunately, Deanna wasn’t feeling super well that day, and although she kept pushing, I could see that it was unlikely she’d be keen to do the entire summit route with me. Ultimately, we emerged on a bit of a plateau area that gifted us with really impressive views already. For Deanna, this was enough climbing for the day, and she wanted to head back. For me, it meant a tough decision, as I *really* wanted to summit. Eventually, we decided that she’d hang out on the plateau while I tackled the last bit alone. 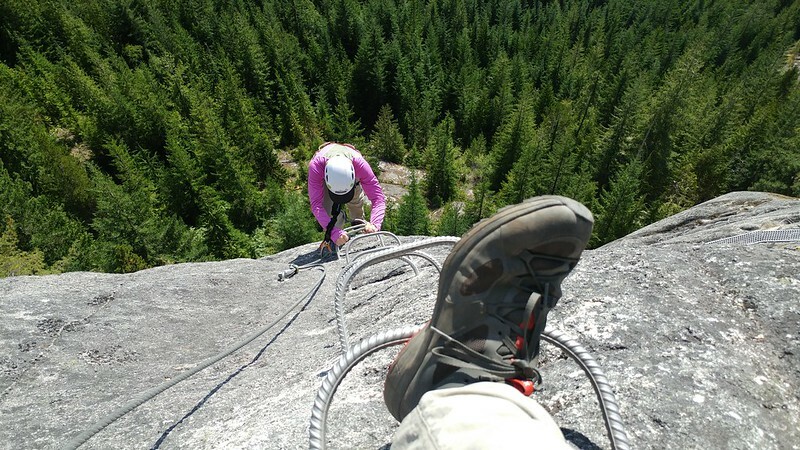 Partly for safety, partly because Deanna wasn’t too keen descending the technical bits alone (and a bit paranoid about wildlife). As luck would have it, shortly after I took off (at a pretty good running pace), I crossed paths with a group of three fellows who had been trekking and camping up here for 4 days, and were heading back down. I secured their promise that they would convince Deanna to descend with them. The benefit was that she’d have company for the descent, and be able to take her time, and for me, it meant I could push harder, sumitting strong, then having a good run back down to [hopefully] catch back up to them before the base. Friends, let me tell you, that final scramble (which included another 500m of vertical in a short distance) was AMAZING, and exactly what I needed. I felt free, and was having a true adventure. I lost the trail on a snowfield, and ended up heading part way up another summit before realizing my error (I was packing a GPS with topos). The last push included pure scrambling, requiring hands and feet at some points. The reward was having my sandwich on the summit, surrounded by amazing views as I watched clouds swirling in a bit. The weather had been amazing, but I didn’t want to push my luck too long, so after about 10 minutes on the summit, I turned tail and started the super-fun scramble / run back down the trail. It took a long time before I finally caught up to the rest of the crew far below, and was happy to see Deanna feeling much better. Another hiker had been kind enough to give her some pain killers, and they’d kicked in for the descent. As a result, after coming out at another vantage point with the trio of hikers, we opted to start running again, to make it back to camp before too late in the day (as it was, we were on track for supper time anyway). We had a great run down, and thanks to having tired myself out with the summit bid, we had a similar pacing all the way down. Before finally wrapping up, we stopped at a water crossing to cool off our muscles. Yowza! Alpine waters sure are effective at cooling you off. What sweet relief! We enjoyed the warm sun, cold water, and good company for a bit before running the final few kms to camp. All told, my day saw me cover 20km and Over 2,000m of climbing. It was a memorable way to cap off our camping in Golden Ears! After another nice night camping in perfect conditions, we got up early once again to have breakfast, break camp, and make our way to the Squamish area. After, all, we had plans waiting for us there already! 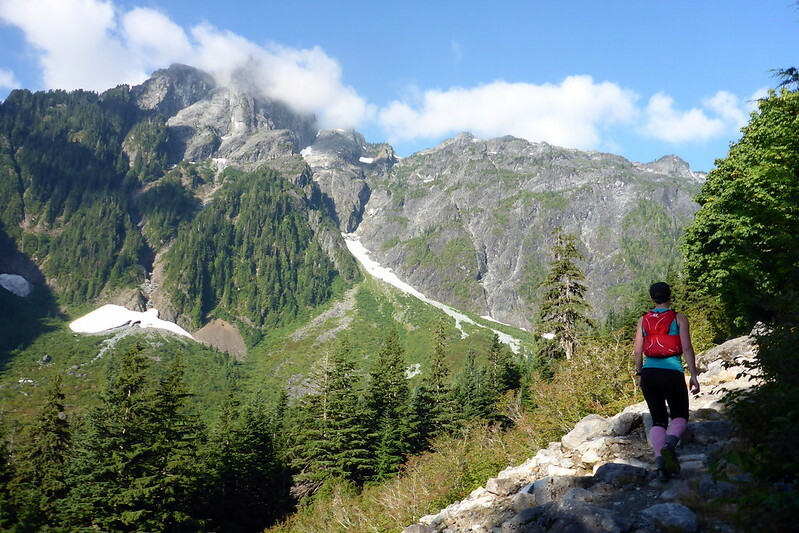 I’d been fortunate enough to work with Tourism Squamish on setting up a fun 2-day itinerary, and Day 1 had us heading up a mountain the easy way, climbing on said mountain the easy way, and of course, enjoying views and suds up there. If you’re looking for the TL;DR version, scroll to the bottom now, and you can watch the video I put together of our Squamish adventures. 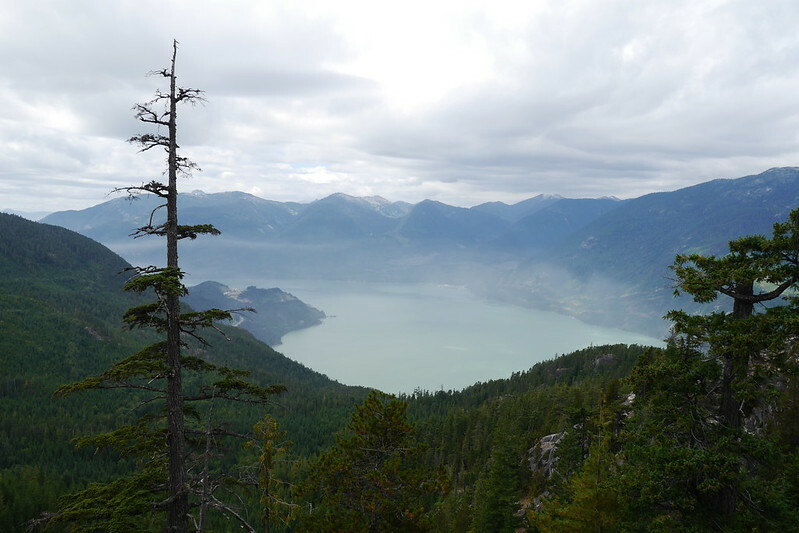 The first adventure was heading up the Sea to Sky Gondola, which whisks people up from the base of the mountain near Howe Sound to high up in the mountains. Of course there are really nice hiking trails to make that journey, but given the previous day’s hike, and the looming race in 2 days, I reluctantly agreed to the gondola. It was FUN! 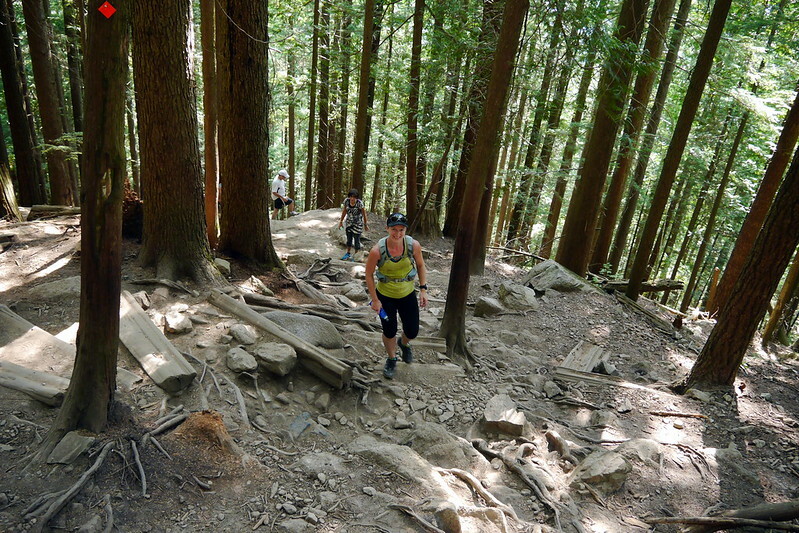 At the top, there are another series of trails, with a mix of family-friendly hikes, up to more advanced trails to head further into the mountains. Again, tempting as it was, I’d promised Deanna a more ‘taper-like’ day. So after strolling all the family trails, the amazing Sky Pilot Suspension Bridge, and marveling at the views from the main observation deck AND the platform on Panorama Trail, we were ready for another adventure. That adventure? Why the Via Ferrata on the mountain of course! I’ve been wanting to try one of these for a long time, so I jumped at the chance. We ended up being the only folks taking part in the late afternoon group, so we had the guide all to ourselves and spend as much time playing on the granite face while securely attached. I’m pretty sure in the world of Via Ferratas this is one of the ‘easier’ ones, but the guide was good at giving me options to make it more challenging. This included me not using the rungs for my feet for most of it, and also tackling the final section without any use of the included aid, making it more like pure climbing. It was truly a fun experience, and a unique way to take in some of the spectacular views. Of course, as you can guess, we capped things off by enjoying beers and watching the day waning around us, as it was late afternoon. Amazingly, we learned that a mere week ago, they had NO views around here. The wildfires had brought very poor air quality. 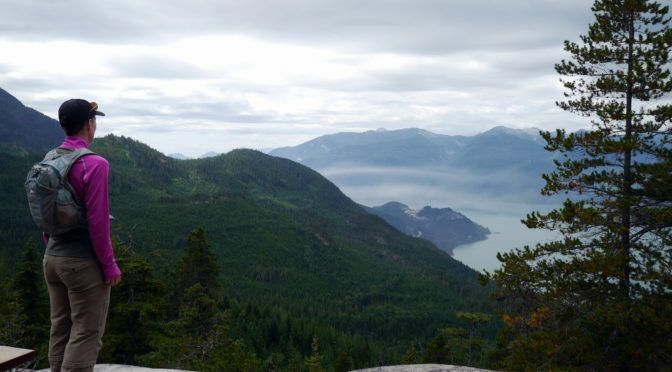 We saw pictures of days where you couldn’t even see Howe Sound below, and the sun was a mere orange blob obscured by smoke. We were so fortunate, as just as we had arrived in the area a few days ago, there had just been some rain, and the air completely cleared up. We had SPECTACULAR conditions! Once we made it back to the bottom, we checked out the now-deserted Shannon Falls with amazing sunset colours playing on the cliff faces before heading to our hotel. We stayed in the Sandman Hotel, which had an amazing 2+ storey waterslide in the pool area. After playing on that for a while, and relaxing in the hot tub, it was off to sleep to rest of the next day. For our last day before getting race-ready, we opted to go tandem kayaking on the Howe Sound. I don’t think conditions could have been better! The funniest part of the paddle was our guide. Why? Well, because I actually knew him. As in, I had suffered with him in a multi-day race. It was none other than Eduardo from Costa Rica, a fellow I’d raced the Gaspesie Adventure with a few years before! I didn’t even clue in that he lived in the region. It was great catching up with him as we slid across the water to arrive at Galileo Coffee, no doubt one of the highlights of the day for Deanna to have a delicious coffee! I was happy for it as well, as it meant she couldn’t get too annoyed by the fact that the rest of the day would be spent touring the 3 local breweries! However, before that, it was off to a locals’ favourite spot for lunch, Mag’s 99 Fried Chicken and Mexican Cantina, and yes, it was as awesome as you might imagine! After a filling lunch, we wrapped up the tourist experience by visiting all three of the local breweries, meeting the brewmasters, and sampling their wares. 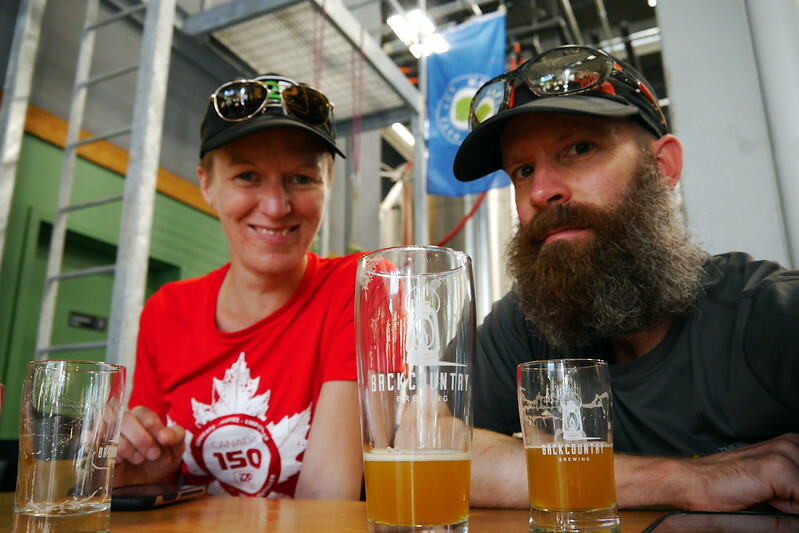 After Backcountry Brewing and A-Frame Brewing, our final stop was Howe Sound Brewing, which for some reason treated us like royalty! Eduardo actually joined us there as well, and we stayed well into the night enjoying delicious food and flights of beer. We bumped into a few other racers as well who wanted to chat about the upcoming race. All in all, a fantastic way to cap off a couple days being a tourist in Squamish. It’s safe to say I’d love to spend more time there (retire there perhaps??). One more night at the Sandman before changing gears, moving locations, and getting ready for the races! But, to hear the tales of that, you’ll need to read the actual race report instead! 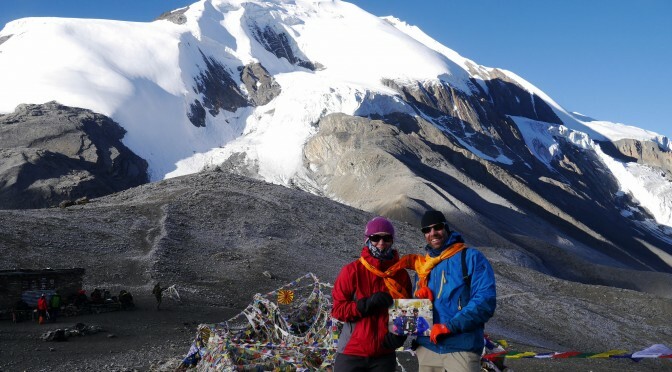 As you may recall, in our last post, we were bedding down over 4,800m to get some sleep before tackling the highest point of our trip, Thurong-La Pass. We had been looking forward to this day since the start of our trip. As this was our 2nd wedding anniversary, I’m already unsure how we’ll ever beat that for our future anniversaries, but that’s a thought for another day. To refresh your memories, here’s ther map of the last few days, as well as the coming 2 days. Read on for the full details! Well, this was it, the BIG day. Not only was this our wedding anniversary, but we’d also be crossing the highest point that we’d ever been at together on foot. The morning started out obviously very cold and dark, but we were pretty efficient at getting moving, packing up our bags yet again, and piling into the dining room to have a warm breakfast before finally taking off well before any light was to be seen. Our goal had been to sneak our before many of the other trekkers, in the hopes of having the summit all to ourselves (or close to it). Based on the distant glow of headlamps spread along the climbing trail before us, it was obvious we’d missed that boat. However, since we are pretty quick, we passed most of these people on our way up anyway, beaten only by one other group. In fact, it was a group we’d seen the past couple days on the trails. Frost covered the ground as we picked our way along the trail towards the pass. Due to the cold, and general dark, there wasn’t much to do other than just walk. We could really see much, nor could I take any pictures. But that was ok, as we knew that we’d shortly be at the top, and that [hopefully] the sun would be shining. Just as I was starting to feel a little chilly, I spotted the first signs of sunlight when the peak of one of the nearby mountains was hit with the suns’ warm glow. Hurray! Interestingly, in the past 2 days. we’d also picked up an extra traveler, in the form of a little furry 4-legged trekker. Yup, we had a doggie tagalong that was following us up and up, and would end up sticking with us all the way up and over, eventually even staying near our hotel at the end of the day. We ended up nicknaming him “Annapurna Arthur” after the adventure racing dog that joined a Swedish AR team at the AR World Championships in 2014. Even though it was sunny when we finally got to the pass, it was still quite cold up there. 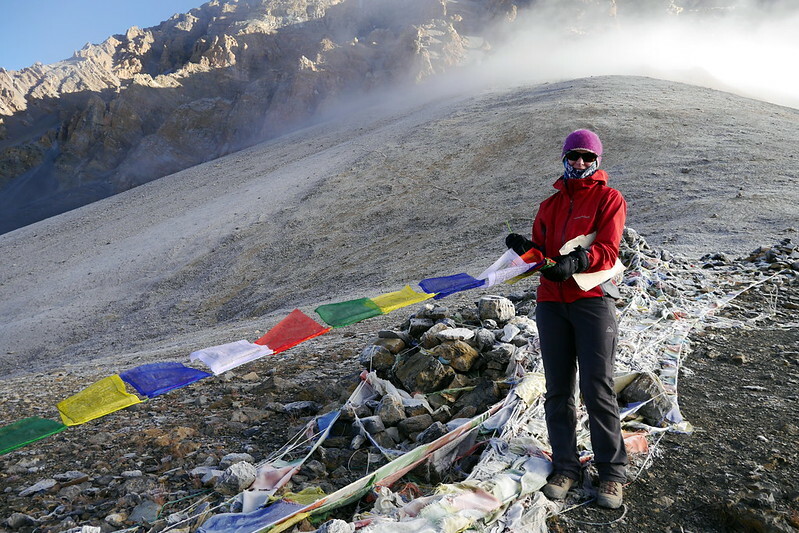 Similarly to the last pass we’d climbed over, Deanna and I took the time to bless some prayer flags and add them to the pile of other flags already there. We were also surprised by our guide and porter with a special blessing and given special silk scarves to wear to mark the occasion of our anniversary. It was obviously a pretty special day for us! Even though we were sitting at 5,316m, we spent a fair bit of time up there, since we knew we’d be dropping down pretty low by the end of the day. We posed for quite a few pictures, including the 2nd in our ‘Wedding Inception’ series, where we held a picture of us holding a picture of our wedding day. Our plan is to pose for a new picture each year with the previous year’s picture. As we get older, each picture will remind us of the special parts of each year we spend together married. After the pictures were wrapped up, we ducked into the tiny tea house situated at the pass for a warm cup of tea and some cookies. In the hut, the group of French tourists we’d met the day before and who beat us to the top today actually sang an anniversary song to us and wished us well. It was pretty cool. 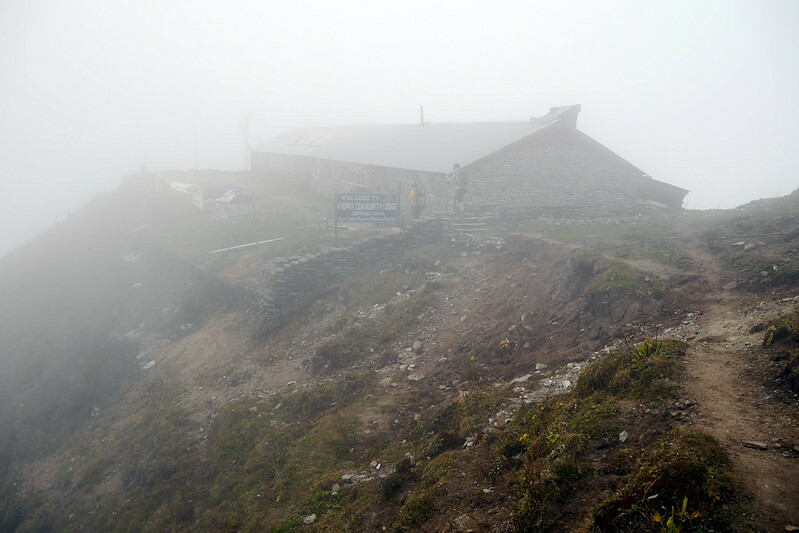 But let’s also pause and consider the fact that there is even a Tea House up here at 5,316m. Every morning, the owner trudges up from far below at Thurong Phedi in order to open it up, get the water boiling, and ready to serve tea to the first tourists that arrive. Obviously there was quite a premium paid for this tea, but given how hard it is to even boil water over 5,000m, it was pretty cool! 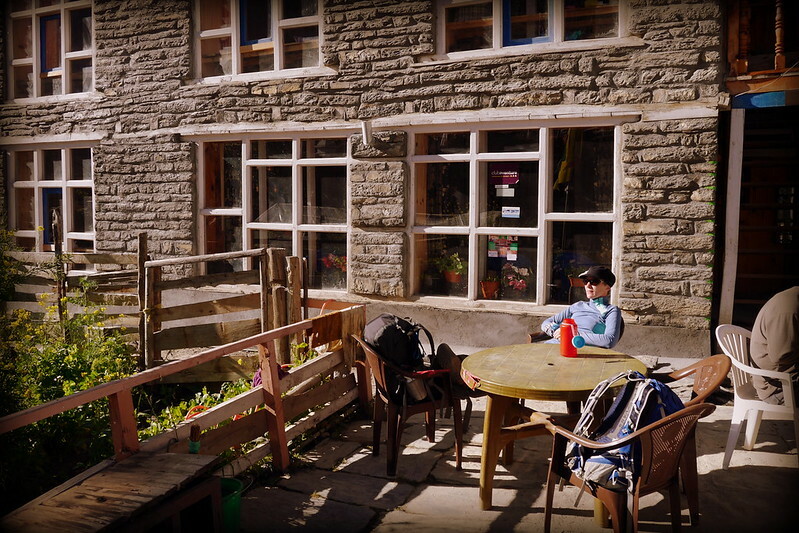 Tea consumed, pictures taken, and general happiness all around us, it was time to start making the downhill journey to our final stop for the day, Muktinath. Mercifully, this was a lot easier than our first pass. The path was a lot less steep, and wound lazily down the mountain. That’s not to say there weren’t still amazing views, because there were, but at least it wasn’t a hair-raising, quad-burning descent like last time. This would make sure that when we finally reached the bottom, we’d still have energy to do a little more hiking and properly celebrate our anniversary. Interestingly, as we made our way down, we could see the lush greenery of the village far below us, and would continue to see it the whole time we made our way there! 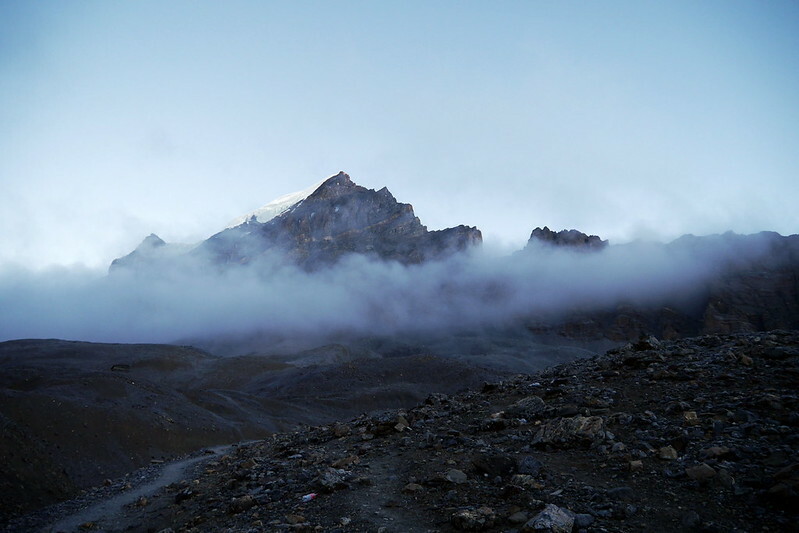 Once in Muktinath, we checked into our hotel, notably called The North Pole. We once again were treated to a nice room with an ‘en suite’ and with electricity. Yup. Luxury! After cleaning up, and settling in, we had a quick lunch, then joined our guide, porter, and a couple other Nepali guys to make a trek to the Muktinath Temple. This is a very unique place, as it is both a Buddhist and Hindu Temple on the same property. That is NOT a common thing. While here, we received more blessings and got to experience the spirituality of this place. The temple is visited by people all around the world, and is considered sacred by both Hindus and Buddhists. After this unique experience, Deanna and I returned to our hotel, and retired to the rooftop terrace to enjoy the sun, watch tourists arriving in the village, and read while lazily drinking Fanta and Beers. Once again, since we’d been quick on the hike, we were well rested and relaxing as other tourists who’d also been to the pass gradually made their way to the village for the rest of the afternoon. We had a nice anniversary supper before turning in relatively early, since we had a pretty long trekking day ahead of us. All in all, a very memorable way to spend our anniversary. We went to sleep feeling both loved and blessed. What more could you ask for? 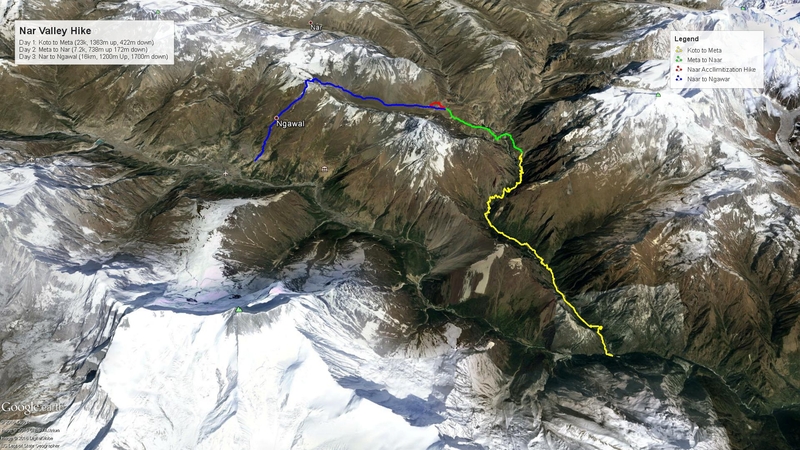 Interestingly, this final day in this part of the Annapurna region was going to end up being over 20km. This was rather unexpected, and was the first time we really felt the effects of the fuel shortage / blockade being imposed by India on Nepal. 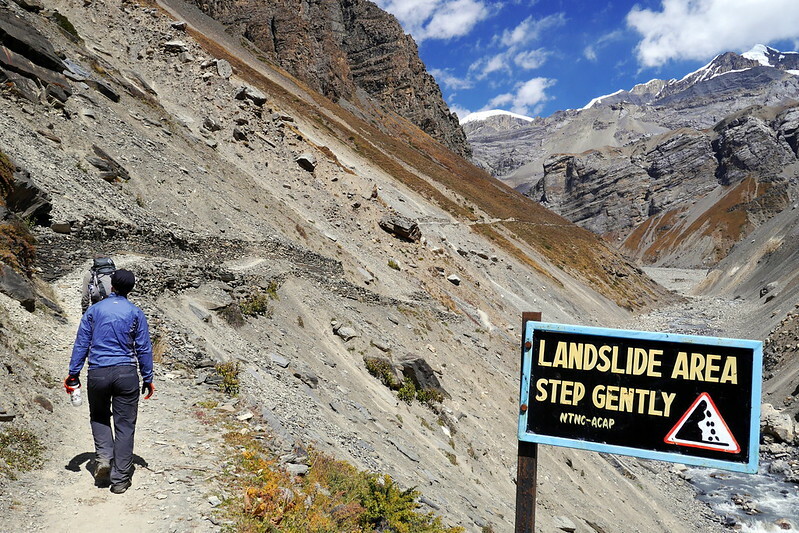 Originally, we were slated to walk a few hours to a place called Kagbeni before getting a jeep to Jomsom. However, due to the fuel shortage, there were very few vehicles, so we’d end up having to hoof it the entire way. While this unexpected trekking might have bothered some, we just rolled with it. 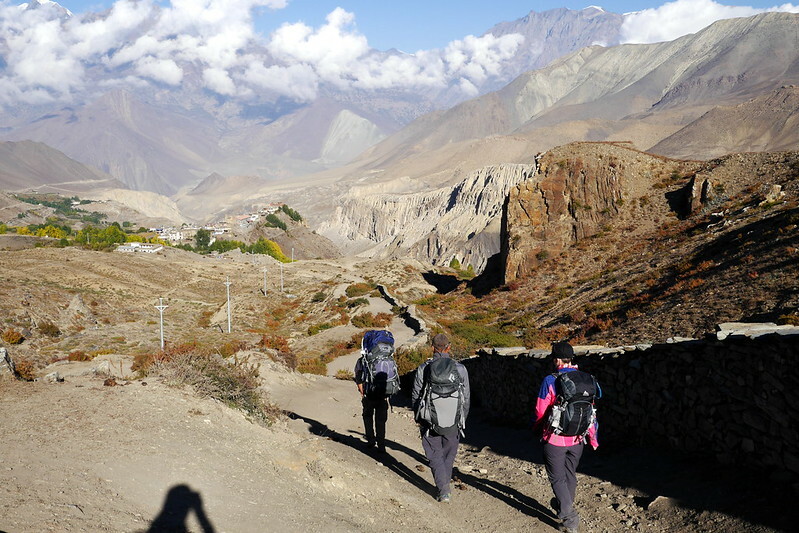 In fact, when given the chance to cut off part of the hike, skipping the town of Kagbeni in order to walk straight to Jomsom, we didn’t hesitate to say NO and do the entire walk and make sure we got to see everything along the way. I’d love to say the entire day was amazing, but truthfully, the time we spent hiking after lunch was a bit of a struggle, but still very memorable. Let me explain. The morning was pretty amazing. We made our way along the roads between the small villages in a nice sun. It wasn’t too hot, and the air was still, so it was a nice hike. We were heading very much downhill. 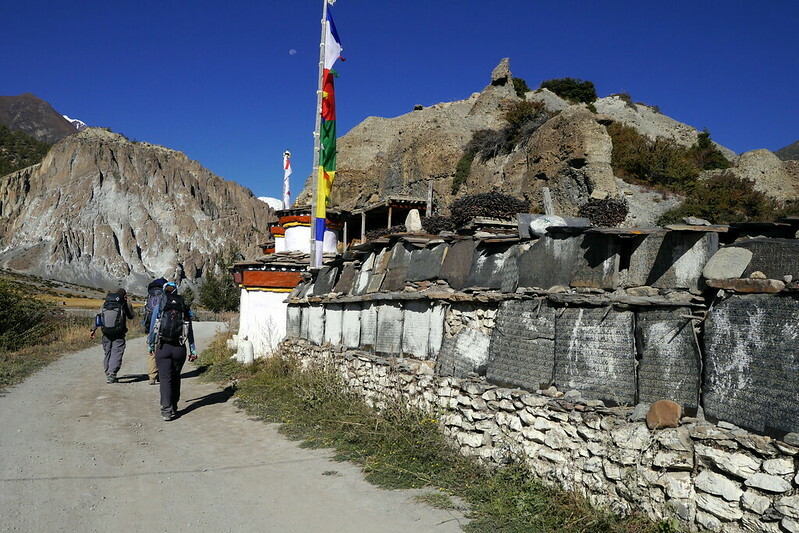 Muktinath was at about 3,760m. 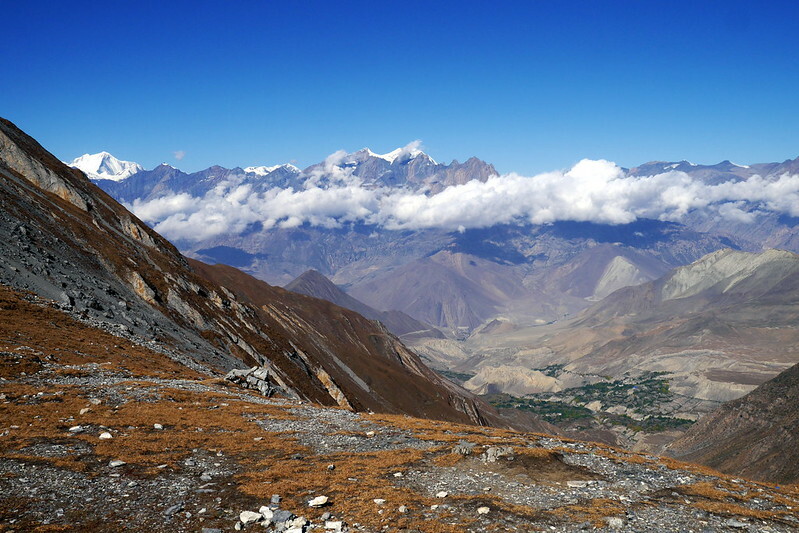 Kagbeni was at 2,800m, and ultimately, Jomsom at 2,713m. Kagbeni itself was a charming village, with a nice feel to it. This is the gateway to another region of Nepal, known as the Upper Mustang. I suspect if / when we return to Nepal, we’d either go to the Everest region or the Upper Mustang. In Kagbeni, we visited an ancient temple, which was very impressive. 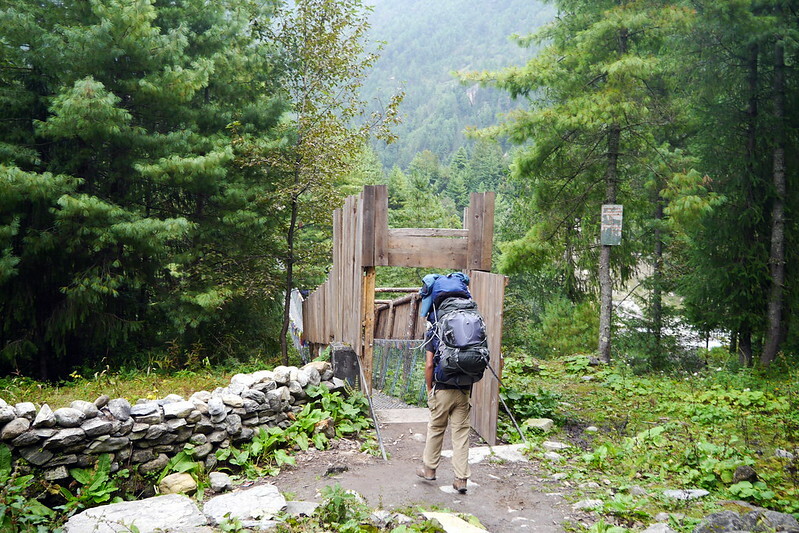 After Kagbeni, we continued trekking along the road to another little village called Ekle Bhattee. It was a pretty small place, but a nice break to enjoy our lunch. After lunch, things got interesting. We were turning southwards and walking along a dry riverbed. Unfortunately, there is an odd phenomenon that in the afternoons, the winds ALWAYS get whipped up. Add to the fact that this time of the year the river is pretty dry, and you will understand why I said it wasn’t so fun. There was a lot of sand and grit blowing into our faces, and the wind at times made even standing rather challenging! 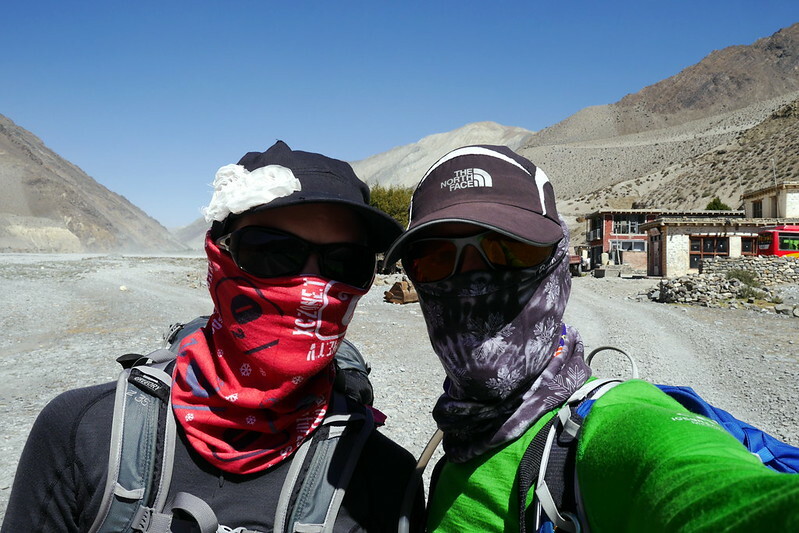 We made the best of it, fashioning buffs into impromptu bandanas, but after a while, I couldn’t even keep the camera out for fear of getting damage to the optics thanks to the sandblasting! This continued for the rest of the afternoon. We could see Jomsom in the distance, thanks to the relatively flat, straight riverbed, but it just dangled out there on the horizon for quite a while. Thankfully, the road was nearly traffic-free, so we weren’t attacked by too much flying gravel! 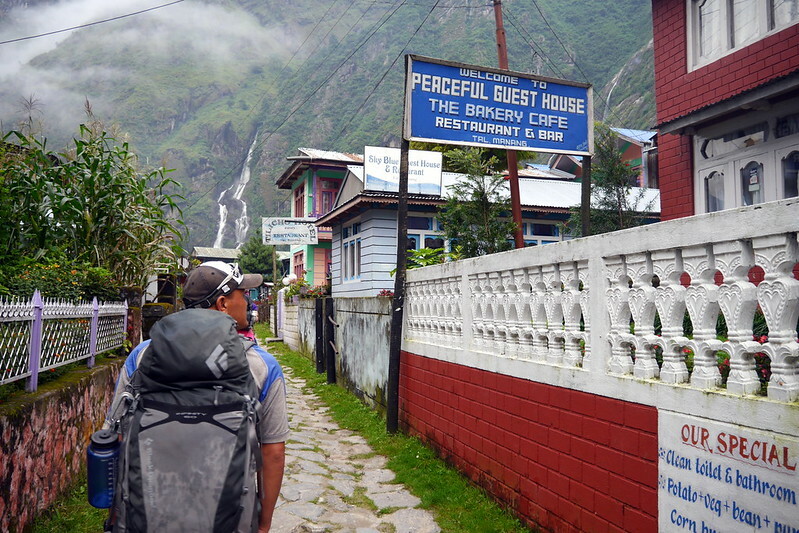 By the time we finally got into the village and checked in at the tourist police station (a normal formality in the permitted areas where we were hiking), my foot was getting very bothersome. I was looking forward to getting off my feet, potentially enjoying a drink, and cleaning up. Thankfully, to make up for the extra hiking in the wind, we scored another nice guest house, with a shower once again! We took advantage of this to both clean ourselves, as well as our [very] dusty clothes. Once cleaned up, and the laundry hung out in the sun to dry, we wandered / toured the village. Along the way, we picked up a bottle of Apple Brandy from a village by the name of Marpha, famous for its apples (and associated products like this brandy). 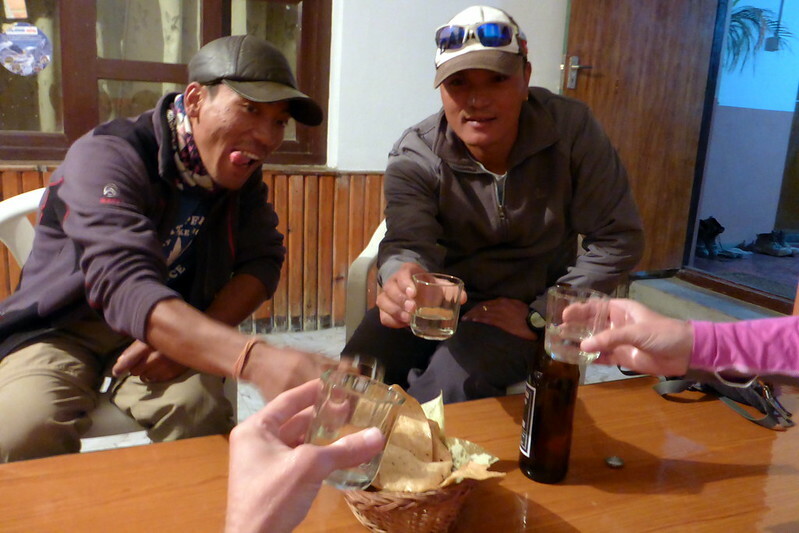 The plan was to share a nice bottle with Ram and Purna, as the next day was a bit of a ‘rest’ day, in that we’d be traveling by 4×4 from here to the start of our next hiking region, further south in the Annapurna region. We met up with a few other travelers as well that evening, swapping stories. In the end, we hung out with Ram and Purna, enjoyed the bottle, and their company. It was Purna’s first time trying the apple brandy, and he and I had talked about this being our treat after crossing both peaks. 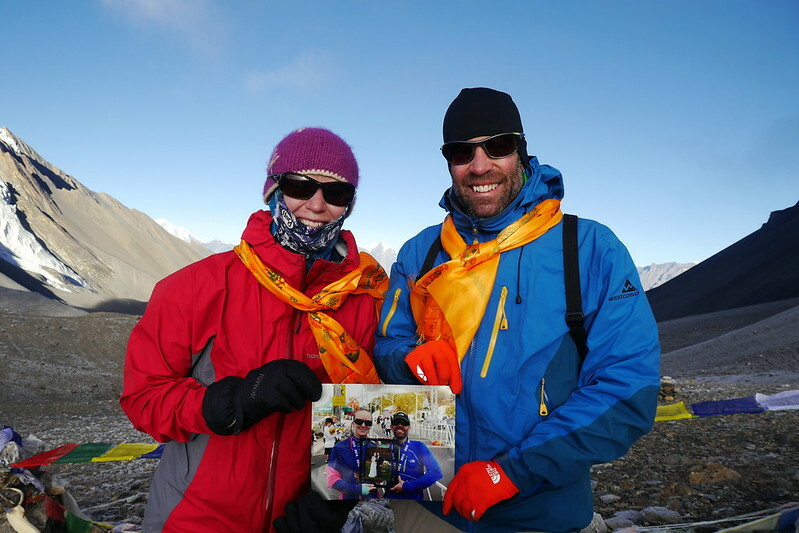 All in all, a great and memorable way to end off our time in the high Himalaya and the 2 summits we’d crossed! Next up, some trekking in a more jungle-like environment. Stay tuned for the next chapters! Greetings all! In our last post, I took you through the more remote parts of our trek where we wandered the quiet side trails through the Nar Valley and up and over the 5,320m Kang-La pass. 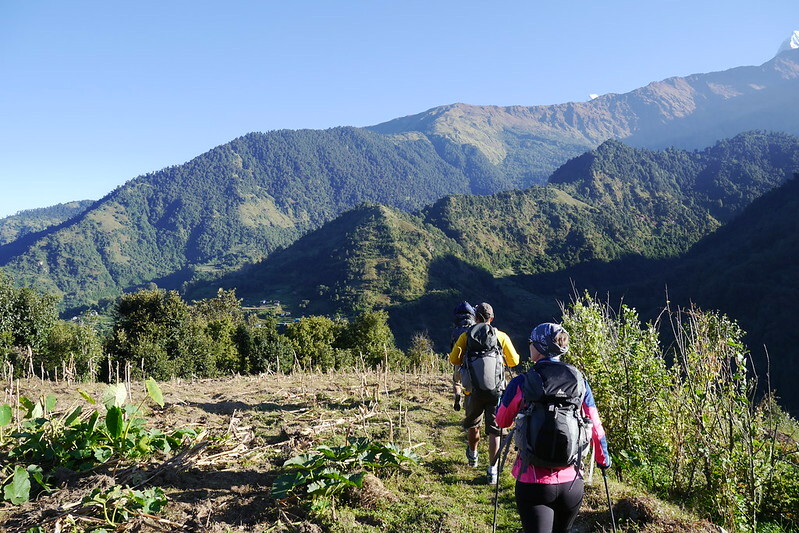 Well, for this post and the next, we now join back up with the main trail around the Annapurna circuit in Nepal, but also drag you all up with us up to the highest point in our trip, at 5,416m. 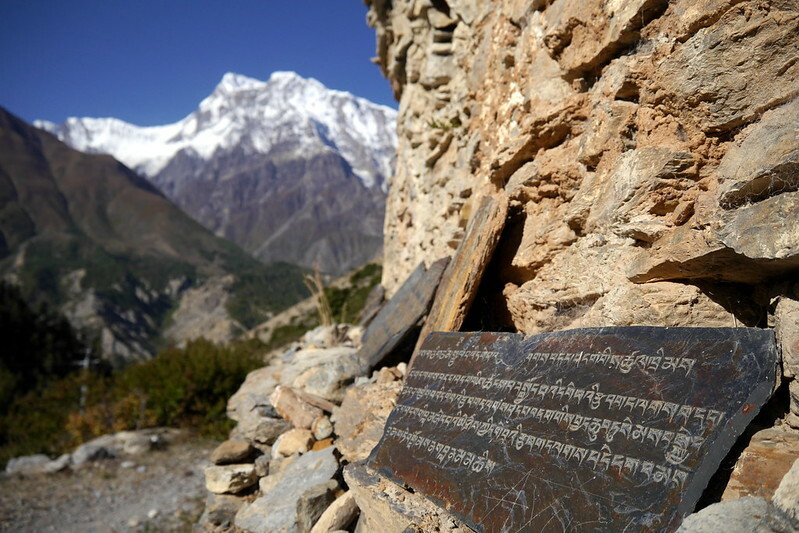 This was the Thorung-La Pass, and was also the day of our 2nd wedding anniversary. Hard to top that! Luckily, the journey up to that height also included a couple shorter days spent enjoying the amazing scenery of the region. Here’s a map of that part of our trip. Read on for the full details of the short days before our 2nd major summit! After our incredibly long and challenging trekking on the day before, where we climbed up and over the Kang-La Pass, it was time for a slightly shorter day to recharge. Luckily, we had just the ticket. Ironically, we made this day even shorter than the original itinerary called. Instead of making our way from Ngawal all the way to Manang (a bigger village), we opted only to go as far as a small town called Braga. Why? 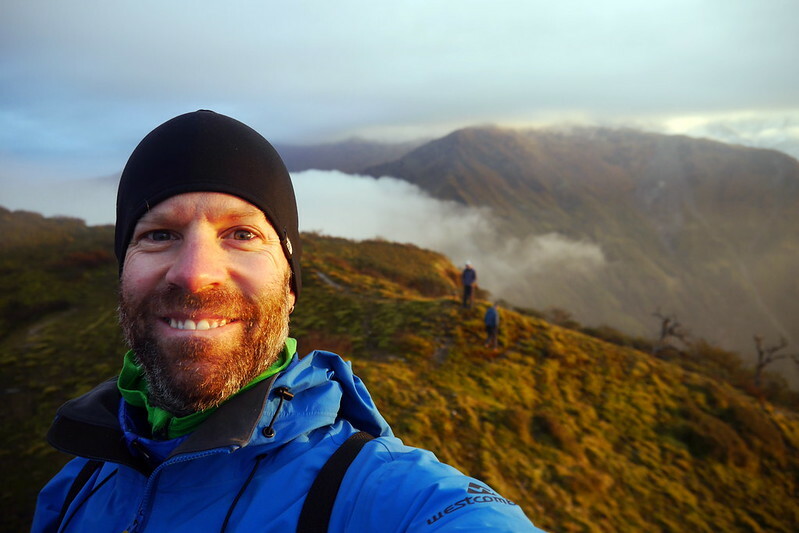 Well, quite simply, I’d seen on a map that there were a few interesting side trips that could be easily hiked there on the same day, so I thought it might be fun to make a short trek to Braga, then spend an afternoon doing just an easy day hike with no packs. The actual hike from Ngawal to Braga was pretty flat and just followed along the valley floor between the two villages. The way was quite dusty, but uneventful. Due to the fuel shortage already well in effect (although not clearly appreciated by us just yet), there was almost no traffic on what is normally a local road used by tractors, and motorbikes. So we had the road to ourselves, with just the warm sun keeping us company as we plodded along. The other reason it seemed like a good idea to have a short day was that poor Deanna was really starting to feel the combined impact of being sick along the trek with the general tiredness of hiking every day. 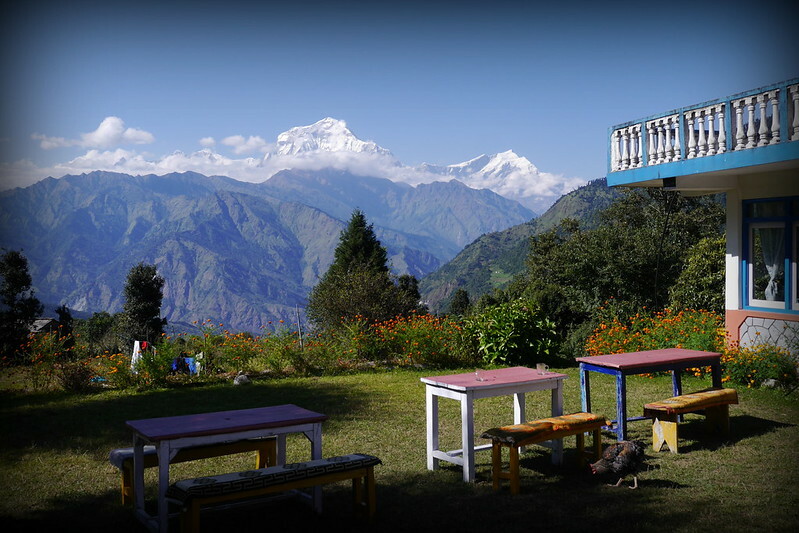 In the end, it meant that she could make the decision to spend the afternoon at the guest house with her feet up and just read a book and drink tea in the amazing sunshine and Himalaya views. Our porter also decided he’d take the afternoon off rather than join in the side hike. So, in the end, it was just our guide Ram and myself who made the all-uphill trek to the mystical Milarepa Cave. I was okay with that, as I knew it would make a happier overall trekking party if people had a bit of personal time. After a tasty lunch, Ram and I grabbed water and snacks, and left on foot. After the long climb, which took us through some really nice wooded areas as well as past a few Gompas, we emerged at the top near the cave. 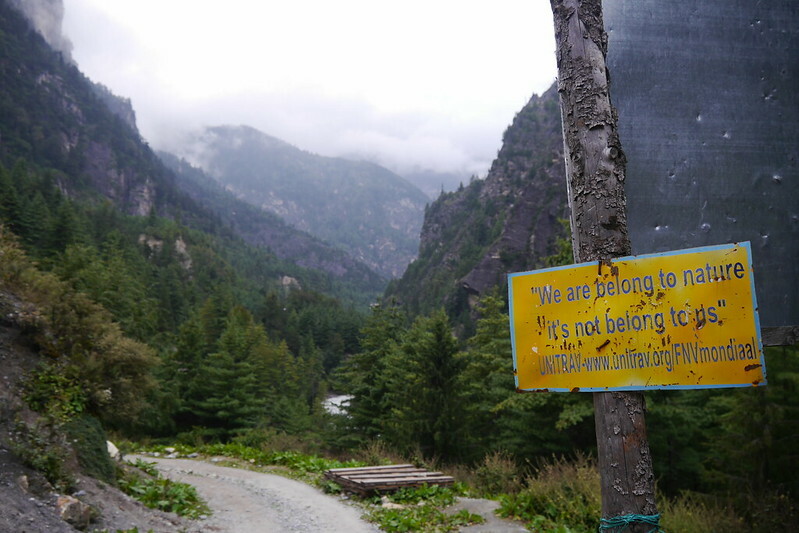 It was a very quiet area, and we hadn’t seen a single soul on the entire trek. 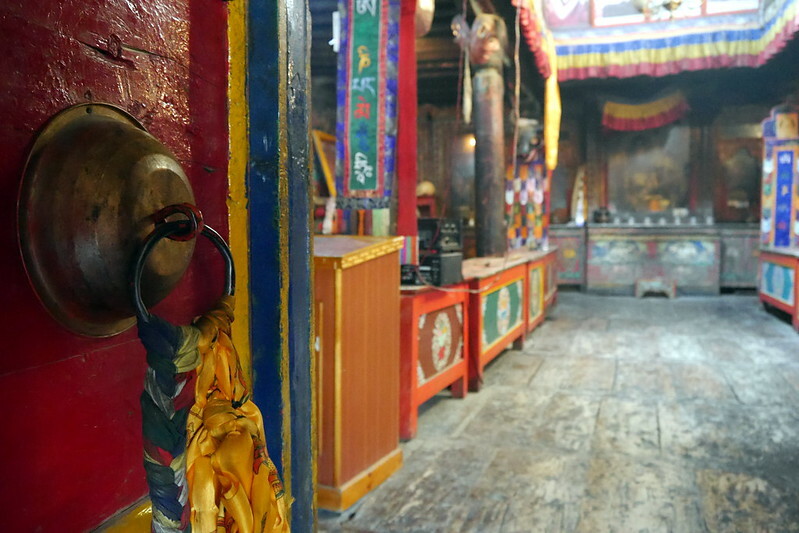 We quietly wandered around the spiritual site, eating a few cookies and having some water. It was just a beautiful peaceful day up there. The walk back was very uneventful as well, and I took the time to watch the way locals work in the fields during harvest time, using the same tools they’ve no doubt used for centuries. Very interesting. To close the day / night off, we had another wonderful meal in this guest house. Interestingly, we were once again the only tourists in the area, and were outnumbered by the family members (and relatives) that lived in the area. As our supper was being prepared, we wandered over to a nearby monastery in hopes of getting to hear and see their evening prayers. Unfortunately, things were already locked up tight for the day. However, in interesting thing did happen after supper. They had satellite TV at our guest house, and after supper, we ended up watching (with the locals), a movie. What movie? Well it was The Mummy: Tomb of the Dragon Emperor. Why is that interesting? Well, part of the movie takes part in Tibet, and the Himalaya mountains, and has Yeti in it. Here we were, in the Himalaya, watching a funny fictional adventure more set in the same area, but with locals. I got a kick out of watching them laughing at the situations and locations, but also had a different appreciation for the portrayal of the region and the temples in the movie. It just all seemed a little surreal! After our short day from Ngawal to Braga, we followed that with an EVEN SHORTER and easier hike between Braga and Manang. 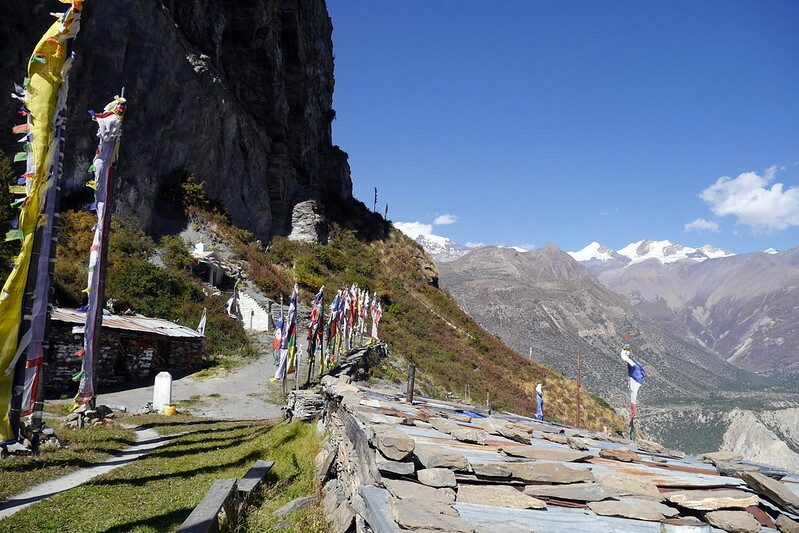 While passing through was certainly possible, Manang is in fact the headquarters for the region, and therefore is a notable stop. 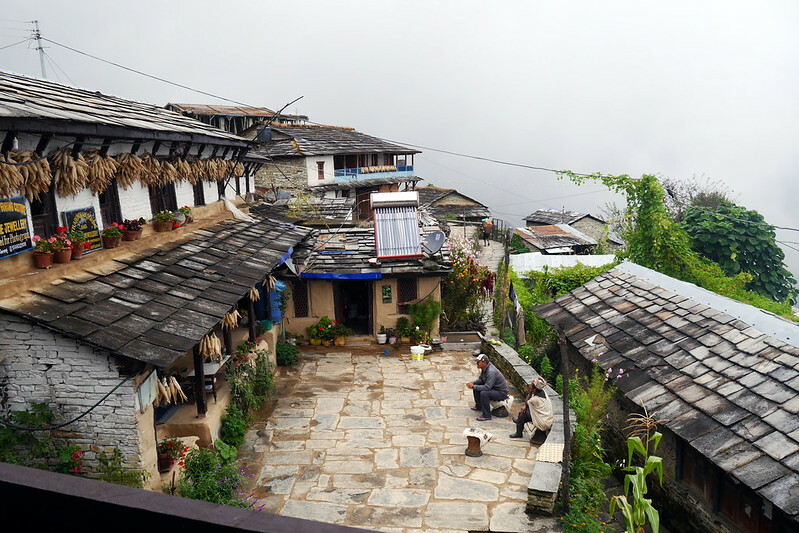 It is also tourist central, and pretty much all trekkers and hikers make a stop in this village of 500 or so houses, which is quite large for the region! Again, however, having a short hiking day meant that we’d have the afternoon to go on a side hike. Again, the hike between the two villages was pretty much a flat walk between two points. Probably not much more than a walk from my work office to the Market and Parliament Hill. But talk about a world of difference in scenery and feel! Just thinking about that for a moment really puts the whole trip in perspective. We saw only a few other people on our hike, spotting more people working in the fields for the fall harvest than anything else. When we arrived in Manang, we were quite early for the tourist crowds, so the guest house we checked into was still quite empty, enabling us to snag an amazing room with windows on 3 sides, looking directly into the Annapurna mountains around us. Spectacular! Not only did we have exceptional views, but this room boasted a first for us in a while. We had an en-suite (of sorts), and, wait for it… electricity! Yup, there was a single outlet in the room (getting power from a solar panel on the roof), which allowed me to charge up everything from camera batteries to my Kindle. The ensuite also had a shower of sorts, so I took my first shower in days, hosing off the layers of dust and sweat with a relatively warm flow of water. We also headed into town to buy some powder detergent, allowing me to do some ‘bucket laundry’ and clean some of my trekking clothes. I’d been heavily recycling my duds anyway, but it was nice to clean them up. Darn western standards stuck in my head right? With laundry done, body washed up, and devices charging, we grabbed another tasty lunch before finally heading out for another afternoon hike. As usual, when you are in a valley, your options are usually limited to uphill hikes to take in the better views, and that’s just what we did. 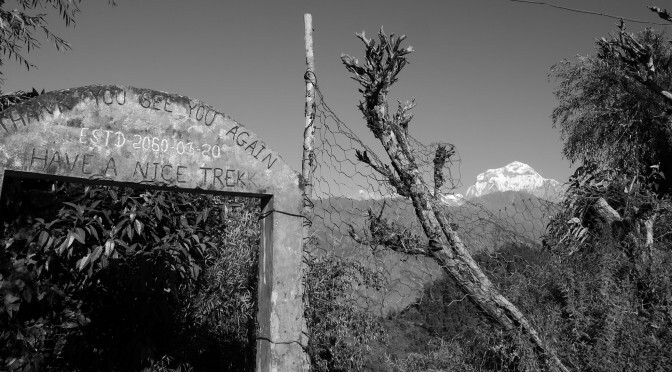 In this case, it was a hike up and along the Gangapurna Glacier. A nice example of a Himalayan glacier that finished off in a nice glacier lake that we got to walk by. At the top of the hike was a superb lookout area with lots of little snaking trails to wander around and take in the view from different points. However, for me, I got a bigger kick out of going pottie in what I’d call yet another excellent example of a Loo with a View. The picture above doesn’t quite do justice, but you get the idea. 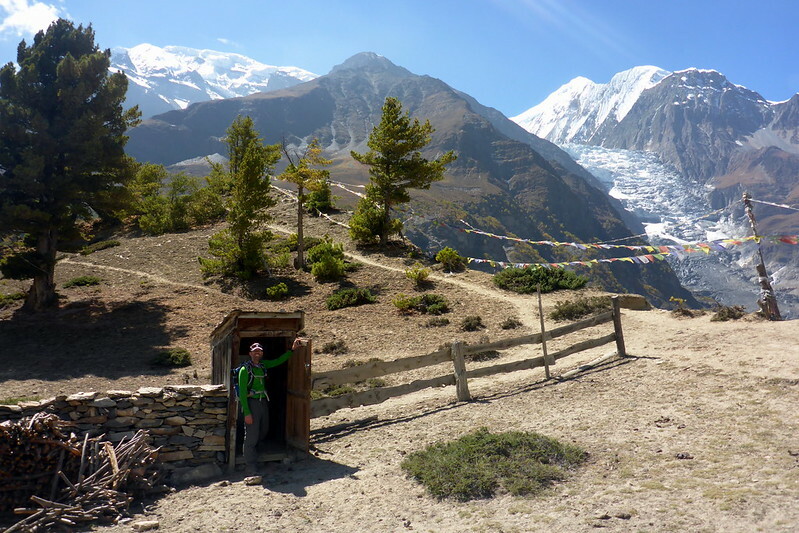 Tiny little squat toilet here at 4000m, with fine views of the glacier and other surrounding mountains. After our day hike, we settled in back at the hotel to meet other trekkers that had now completely filled up our hotel. 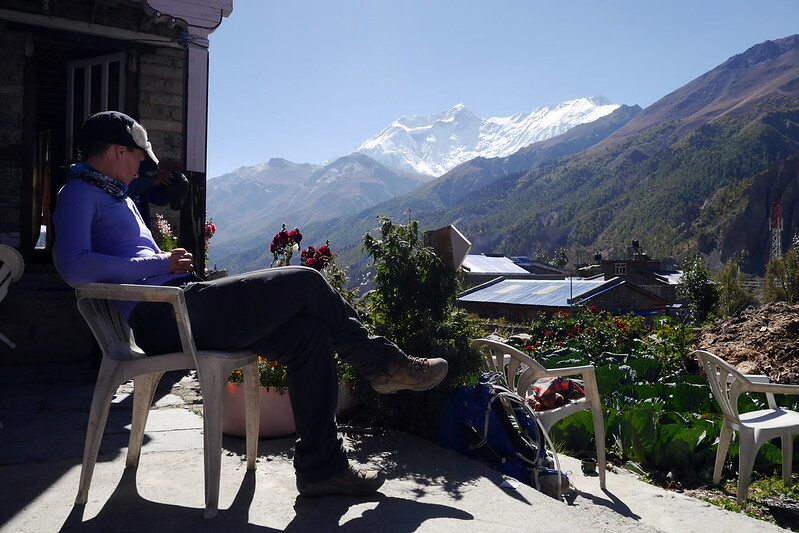 I took advantage of the opportunity to get a nice cold Everest beer, and sit outside chatting with other world travelers. Deanna and I enjoyed chatting with new people and hearing lots of interesting stories and sharing in some funny experiences (which I won’t get into here, but hopefully it will trigger my memory about our bare chested Canadian vagabond friend and his bag of weed that he harvested en route….). All in all, a funny and fun night, that went later than usual. And by that, I mean we may have stayed up as late as 10pm, rather than the usual 8pm curfew. 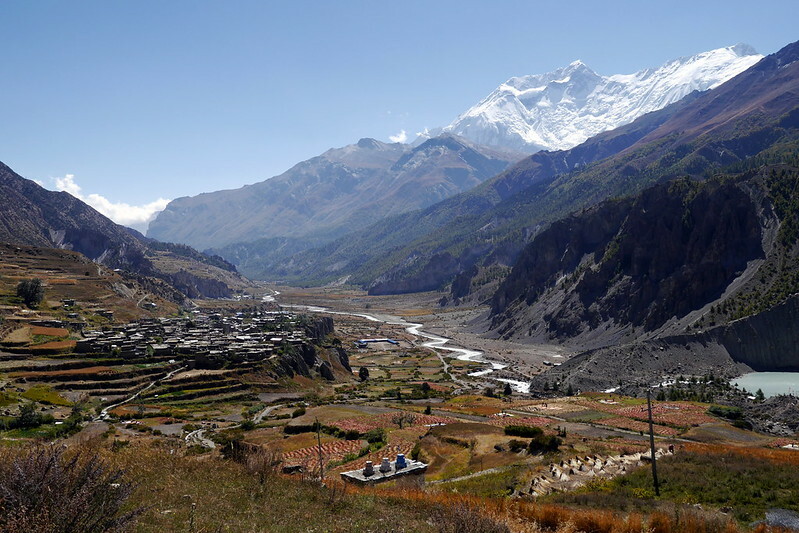 While the plan had been to spend another day in Manang and just recharge there, we awoke the next morning, and over breakfast chatted over options with our guide and porter. In the end, we decided that pressing on might be the better idea. For two reasons. 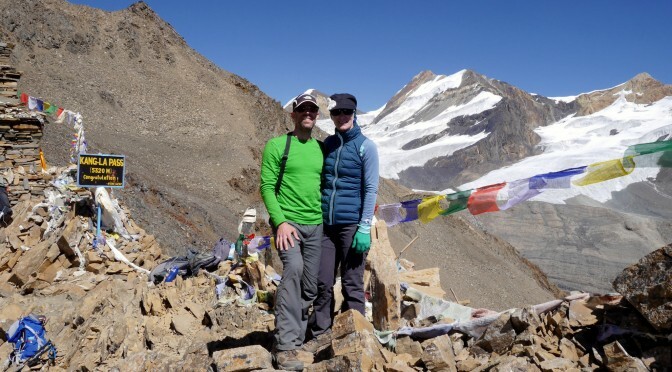 The most obvious was that it would get us to a higher elevation, thereby shortening the next day, when we’d hoped to get as close as we could to Thorung-La pass (making the summit day a bit easier). The second, and more esoteric reason was that it was ‘too easy’ in Manang. We’d found coffee shops, bakeries, lots of tourists, cold beer, plumbing, etc. Frankly, it had been a bit of a culture shock, and we weren’t ready to go back to the ‘luxuries’ yet. So, the plan was to press on, and move onto the tiny village of Gunsang, not far up the valley from Manang, but a world apart in feel. So, with that, we moved on. Another relatively short day of trekking, and this time, with no side treks to follow up with. 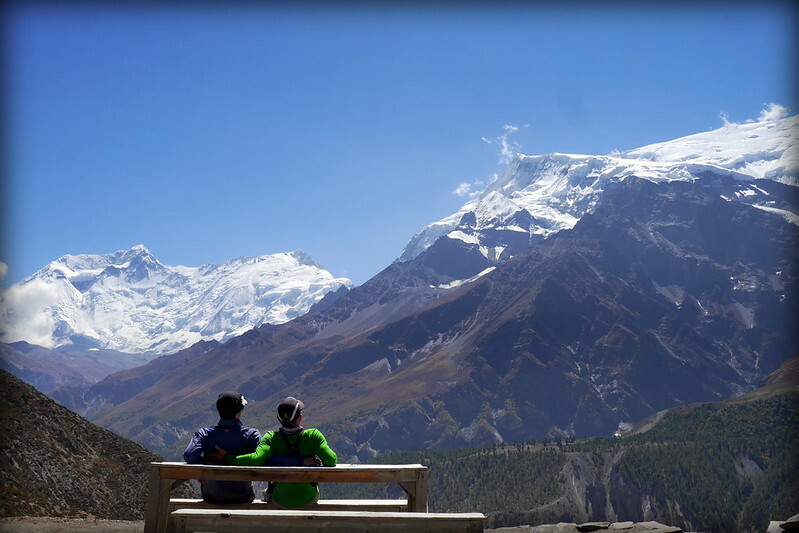 As a result, we didn’t get going to late in the morning, taking our time enjoying a final morning in Manang. What that really means is that Deanna went back to a cafe to have a tasty coffee. We also went to the local post office to send off a couple postcards. We made our way slowly and deliberately, but still covered the 4.3k in about 1h 15mins. That left us with quite a bit of day, and not too many things to do. Luckily, we’d picked up some playing cards in Manang, so passed the time playing various games. Lucky for us though, the weather was still quite amazing, so we also passed some time outside just taking in the view. I think that Gunsang, although it was comprised of basically 3 or 4 buildings, was one of my favourite little stops. Our guest house was tiny, but had a nice rooftop terrace with a bench on it, as well as a courtyard. When the sun was up and the air still, the roof was an ideal place to pass the time in a meditative way. When the wind picked up and made it too cold, you could sit in the courtyard, or move indoors where a nice panoramic window looked out from the dining area to the mountains across the valley. I defy anyone to look at the photo below and NOT be moved by the idea of being in that very spot and spending 10 minutes just staring out! All in all, the rest and recharge would do us some good, as the next day would be another long one, and also finish off at a pretty high place. 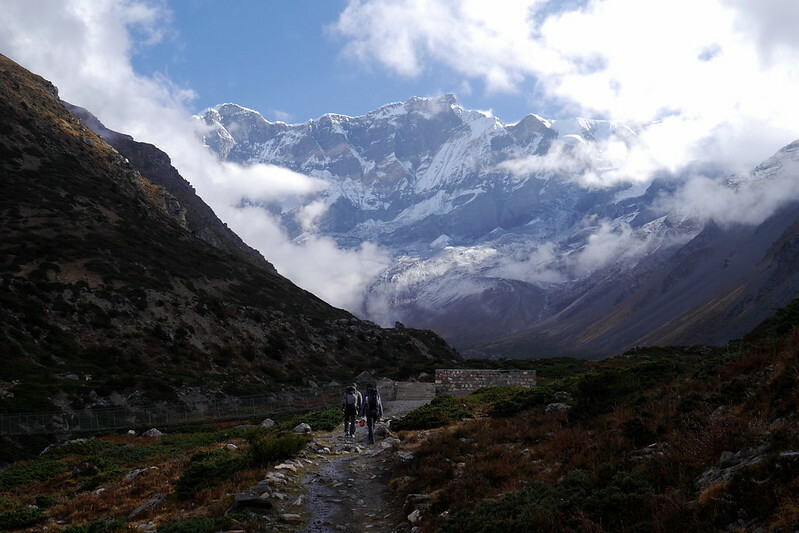 Our plans were to make our way from Gunsang all the way to a place called Thorung High Camp. Basically, the closest place you can sleep to the Thorung-La crossing. Here we are, on October 4th, the day before our wedding anniversary, and the day before we cross the highest mountain pass we’ve ever hiked to together. We got up at a reasonable hour, had our tasty breakfast, packed up, and headed out. 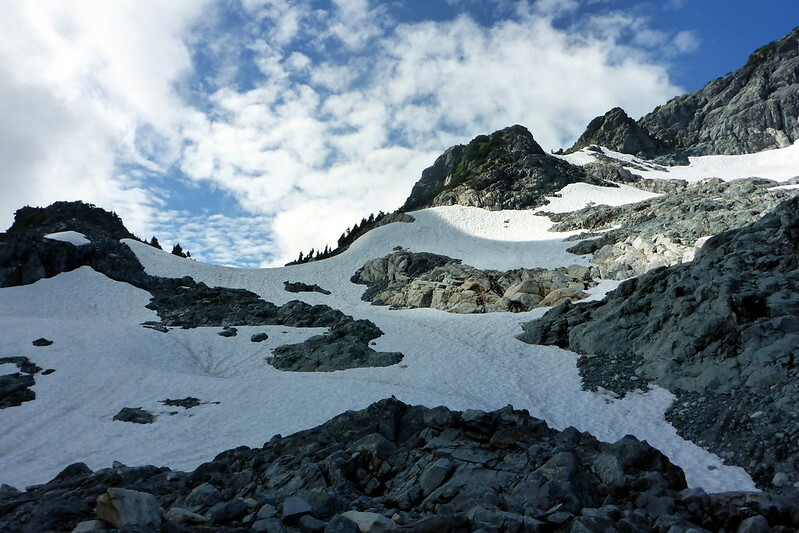 The plan was to hike most of the way to High Camp before even stopping for lunch. This meant a near 14km of hiking, ascending over 1000m before eating again. 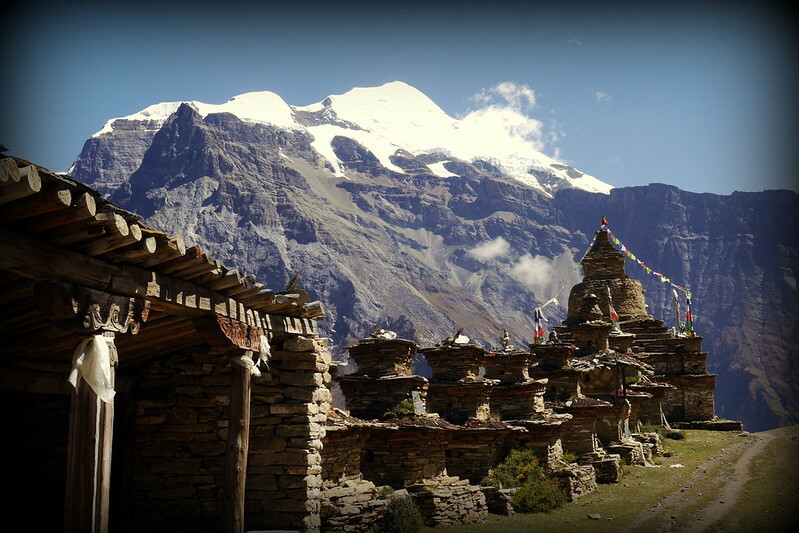 In fact, lunch would be at Thorung Phedi, which sits at 4,525m itself! Luckily, we didn’t really have any time goals in mind, just to continue to feel strong as we went. Unfortunately, this was to be one of Deanna’s toughest days. The cold was really taking its toll on her, and I could see she was struggling a bit (although trying to hide it). In the end, I took both her daypack and my own on my back, allowing her to carry on unencumbered with anything but a water bottle. This helped her bounce back a little bit, and we still made good time. It was funny to note that even though she was ‘struggling’, we were still faster than pretty much anyone else we encountered on the trails. The trek just became more and more beautiful this day, as we got ever closer to the high mountains. By the time we got to our lunch break, it was clear we would be done in good time again this day, leaving us with even more time for a potential side hike / acclimatization hike once we arrived. The most interesting part of this day would be our endpoint, which was at 4,868m. That’s a pretty high elevation to be sleeping, with a LOT less oxygen than you are used to. I wan’t sure how well we’d sleep and how we’d feel. 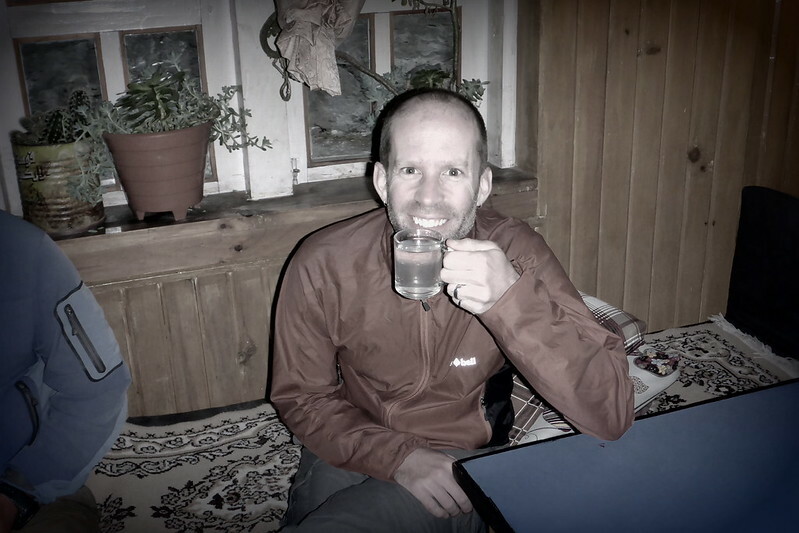 Luckily, we were treated to tea and popcorn for a snack when we got to the high camp, so I knew that I’D feel great. After all, popcorn is a magical food, right? Our room was pretty tiny, and the whole camp was in a pretty barren, but protected moonscape of a plateau high up in the mountains. 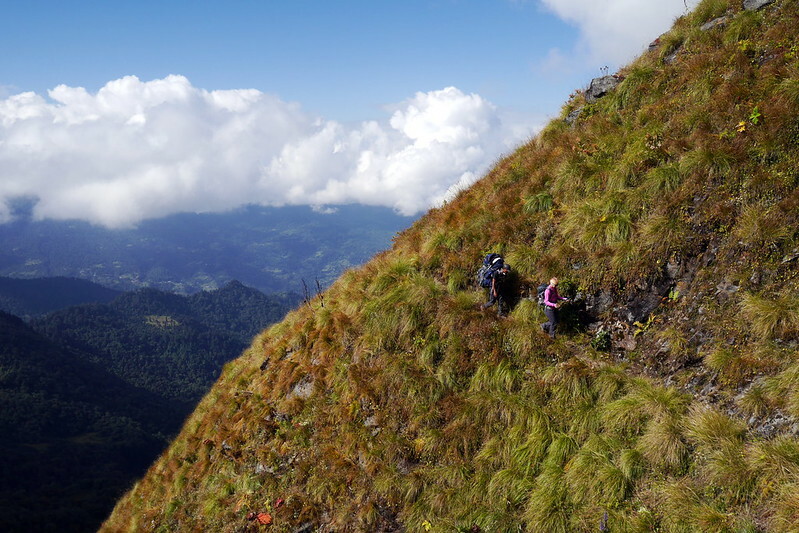 There was a nearby scrambly hike that would take us a couple hundred meters higher and give us a little more chance to acclimatize before the big push on the next day. The four of us took the opportunity to head up that way, take a few pictures and just generally enjoy the views in the area. 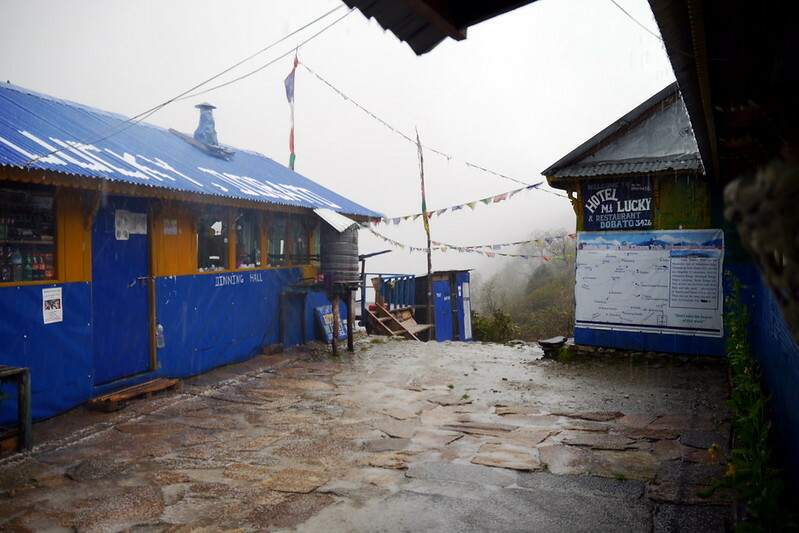 It was a surprisingly busy place, with lots of trekkers now here, and getting ready for the same push the next day. 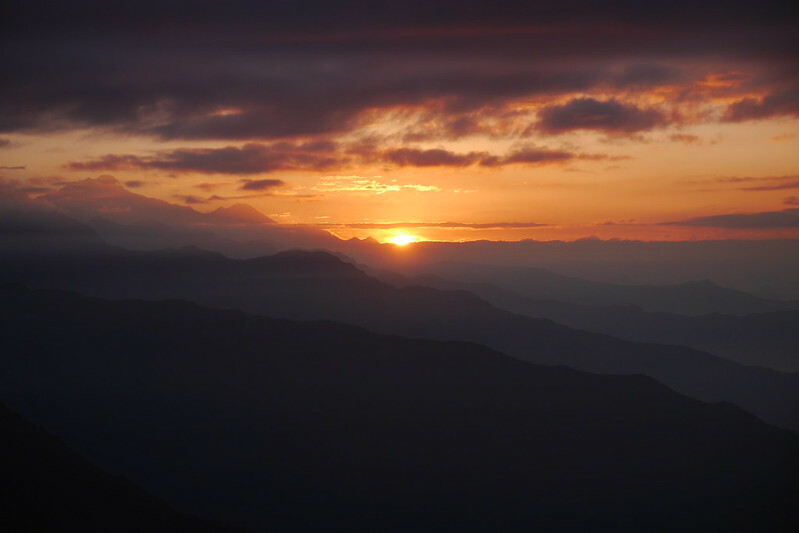 Given the early darkness up here, and the accompanying cold at the high elevation, we didn’t stay up very long after we ate supper. We went over plans with our guide and porter, agreeing to be amongst the first to leave in the morning, to give us the best shot of a quiet and peaceful summit experience. With that, we wandered down to our room, tucked ourselves into our warm sleeping bags, and tried to get some sleep. Stay tuned for the next post, where we pick back up from here, and climb up and over the Thurong-La Pass for our wedding anniversary! After our first couple introductory days of hiking, it was ‘high’ time to get into the proper mountains! The next section of our trip was a 3-day stretch through the Nar Valley, a place only visited by those with the proper permits and an official guide. We were originally supposed to take a rest day somewhere on this leg, but opted to push on in order to be able to visit other places. 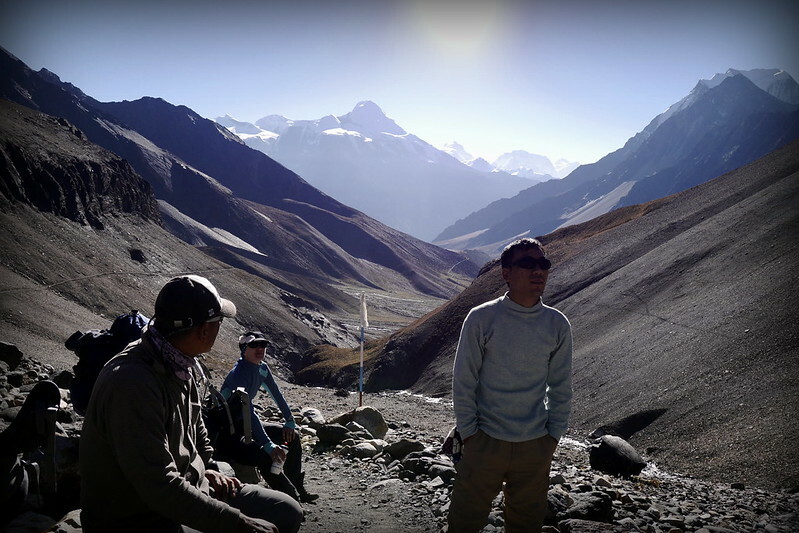 The absolute highlight of this part of the trip was crossing the Kang-La Pass, situated at 5,320m above sea level. 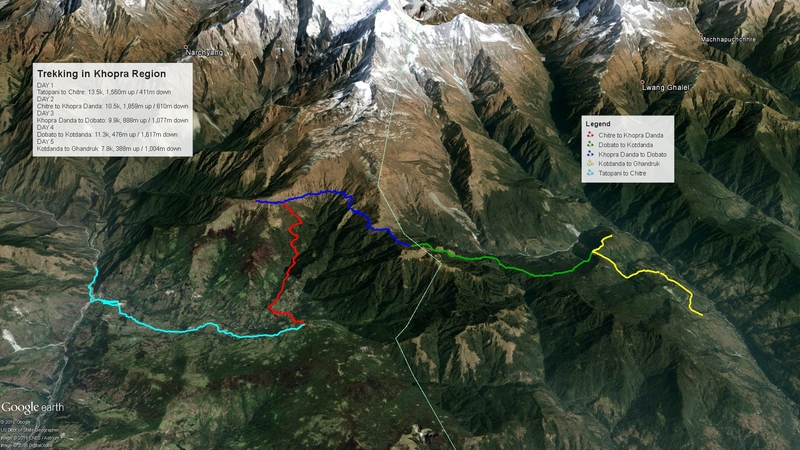 Read on to hear all about it, and check out the map of this sections’ trekking below. 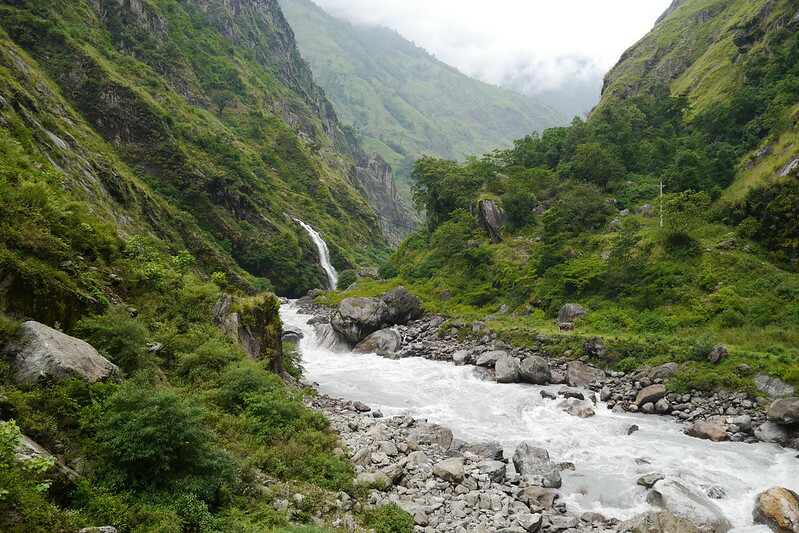 The first part of this trek was a gorgeous trek through the Nar Valley itself. For the most part, this was forested trail, and quite desolate / remote. That is to say, we didn’t encounter a single soul for most of the day along this route. 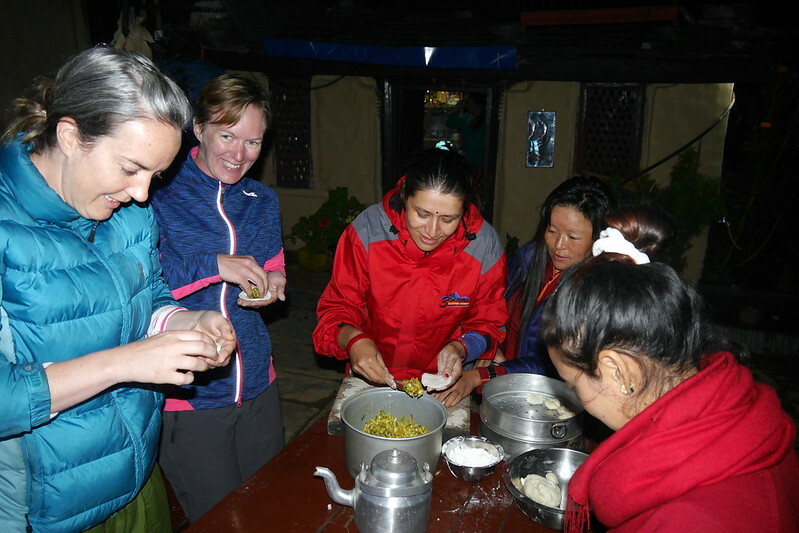 It was also one of the few part of our entire trip where we were crossing through any villages during the day, which meant we actually had a packed lunch and just stopped at the side of the trail to chow down on lunch when we felt hungry. This entire day was pretty much uphill the whole way. 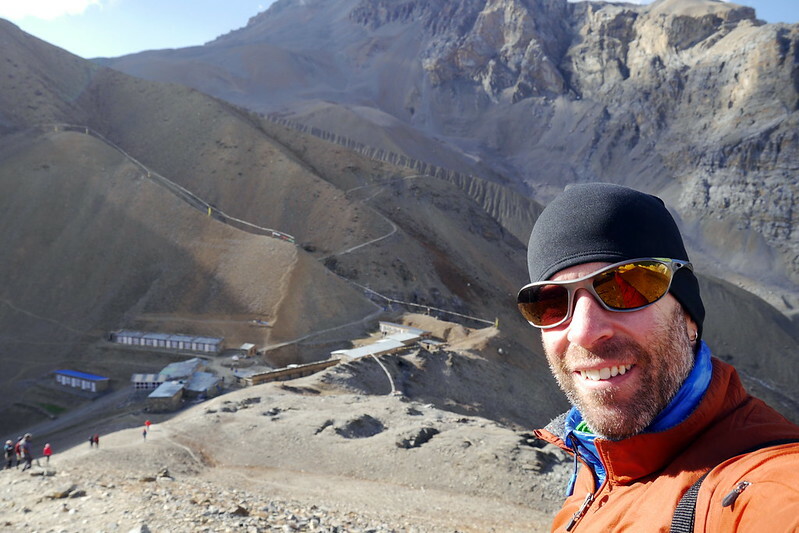 We had started our day at about 2,600m, and finished off at 3,560m. 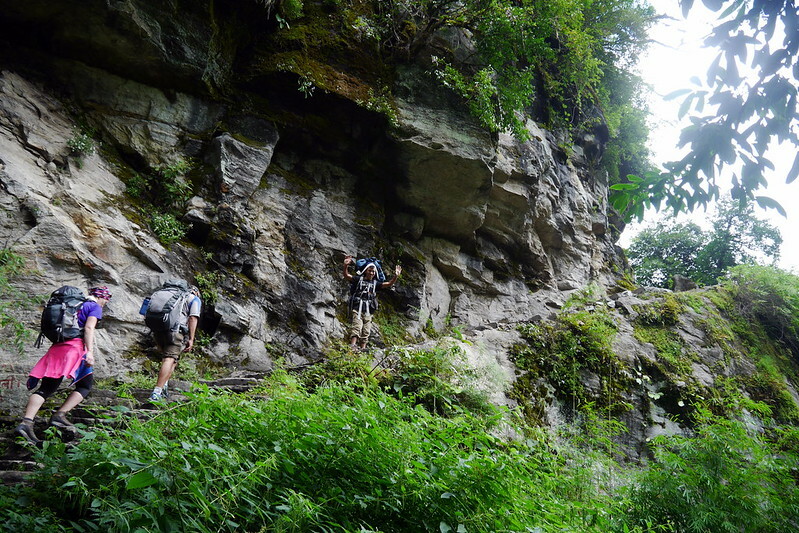 After we crossed the river leading to the Nar Phu valleys, we hiked up through beautiful woods above the Phu Khola (river). The route took us past several small shelters (caves) and a pilgrims’ ‘Dharmasala’. 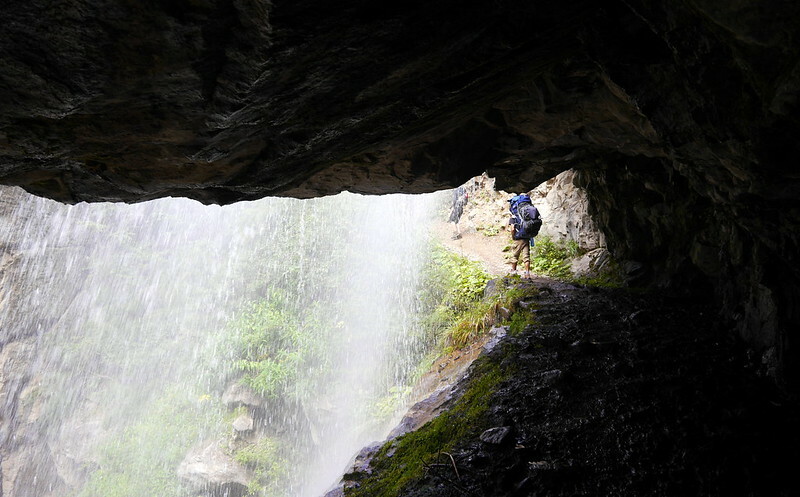 As we emerged out of a narrow canyon, the trail actually passed under a wide waterfall just before the dharmasala, from which point the woods become thinner and the vistas wider. A steep climb up the valley along a small, scenic river brought us to a high pasture on a plateau and finished off at Meta. Although the clouds had been denying us any views of the mountains up to this point, we got a very nice surprise overnight. After a hearty supper prepared in front of our eyes on a roaring fire in the guest house where we stayed (the only one up here! 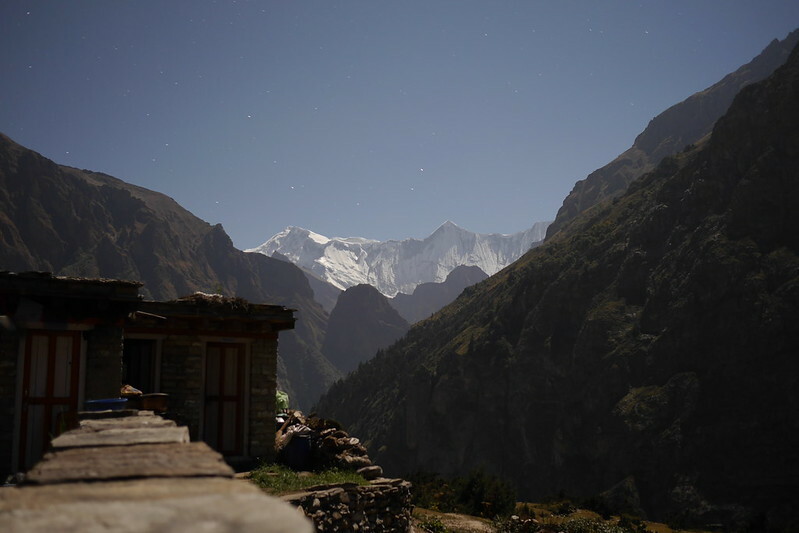 ), we crawled into our sleeping bags to fight off the chilly mountain air and get some rest. However, as often as it does, the call of nature came halfway through the night for me, so I trudged out to find the squatter to do my business. What I say bowled me over! It was a perfectly clear night, and a full moon! It was almost as light as day up there. Of course, I grabbed my camera and a tripod to grab some amazing pictures of this sight. It was great to finally see the mountains, and got me suddenly very excited for the next few days up here in the high mountains! After a ‘brilliant’ night in Meta, we were pumped to get up and start trekking again. We were greeted in the morning with a full bright sun, and near-cloudless skies. Finally, we were immersed in the majesty of the mountains all around us, and would be spending our whole day wandering and marveling in them. Due to the topography, our day started with a lot of downhill hiking down the valley, only to climb all the way back up and out of the valley. Distance-wise it wasn’t the long of a trek (under 8k), but all of this was at higher elevations, so we took our time and enjoyed the day. We’d be finishing off at 4,150m this day. 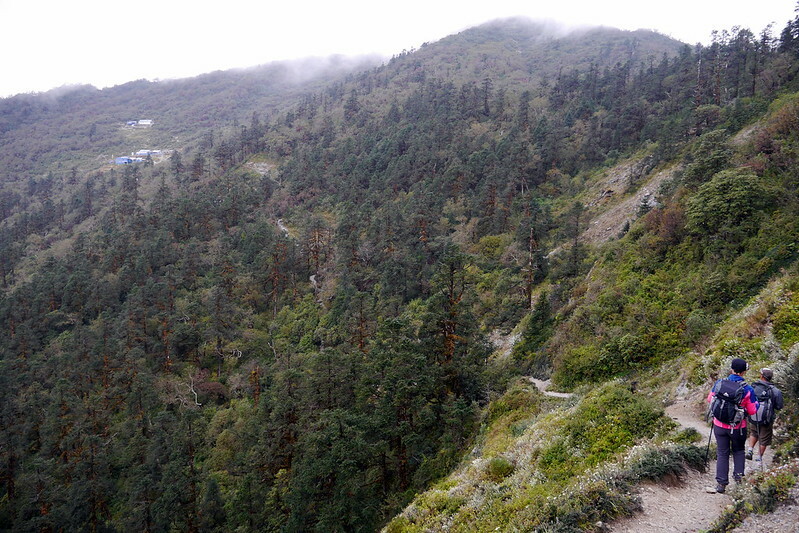 This morning is one of the loveliest walks in the Himalayas. The landscape is white rocks, low shrub and juniper, scattered evergreens, delicate brick-red and orange leafed bushes, crumbling shelves of flat slate, white, sandy trails and gnarled trees. 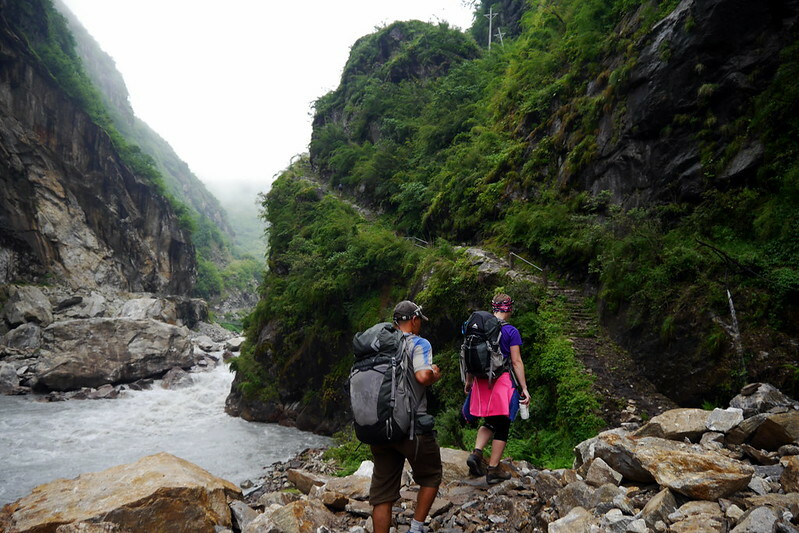 The mountains around us were utterly spectacular, and the Phu Kosi (river) shadows the trail far below. An hour past Meta, Junam is the second semi-permanent settlement, one where “khampas” from Tibet sometimes sheltered. Above the kharka to the right looms a massive glacier, which falls jaggedly down to the high pastures above us. It’s all truly amazing scenery. Across the river, the cliffs contort in swirls and waves, similar to Ladakhi landscapes. 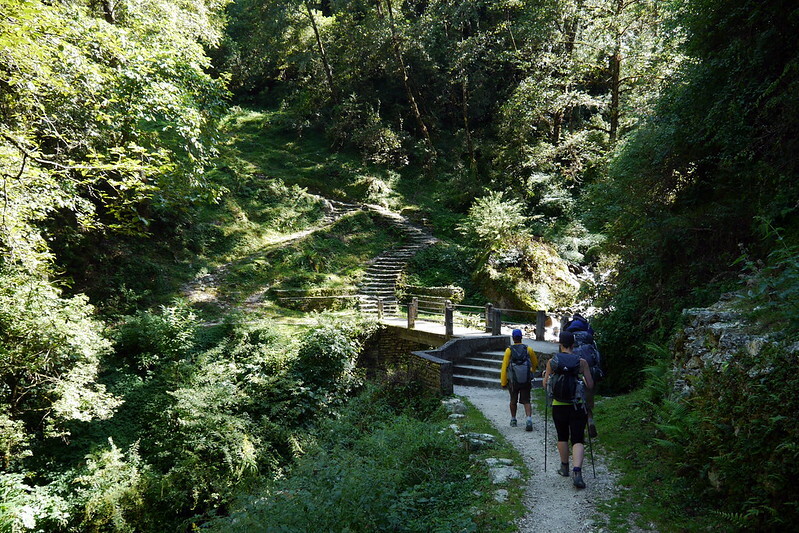 Trek descend to Nar Phedi after crossing Mahendra Pul as we trek down to the old bridge spanning a deep, contoured and narrow gorge. 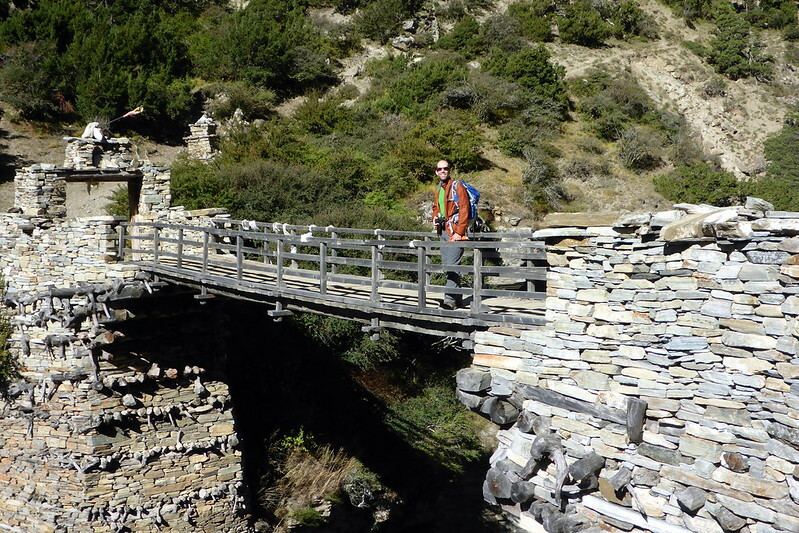 After crossing a bridge a short hike near the Yonkar Gompa as there are 2 monasteries lower one is older and upper one is newly build. From here gradually hike up to reach the Nar gates at the top of the hill, and pass by yet another line of wonderfully painted, bamboo-topped chortens and a large tiered chorten before turning the corner and being rewarded with sublime views of Nar, the undulating patterns of the surrounding barley and mustard fields, four old, colorful and traditional gompas and the snow-peaks looming overhead. 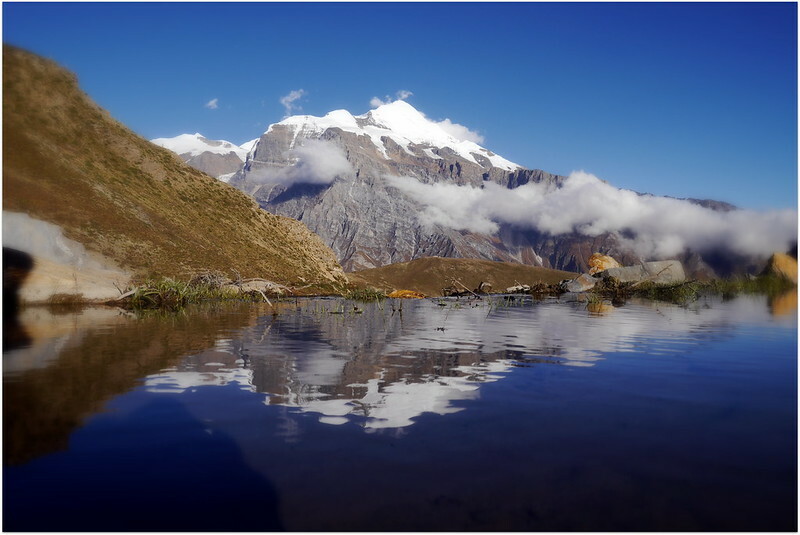 Physically, Nar is not far from the main Annapurna trail, but it feels centuries away, is rarely visited by trekkers and is about as picturesque as they come. I really can’t describe it any better than that narrative, which gives you a good idea of what we were enjoying. Because it was a relatively short hiking day, we were in Nar before lunch. This gave us a chance to enjoy the sunshine, and experience a bit more of the village life, including watching the locals hard at work chipping stones to build a new guest house. It was pretty impressive to watch them working, using only hand tools, and carefully building a structure from stone that is hand-hewn and could stand up to the rigors of life at over 4,000m! Since we had the extra time, we decided to head up a little higher and do an acclimatization hike. 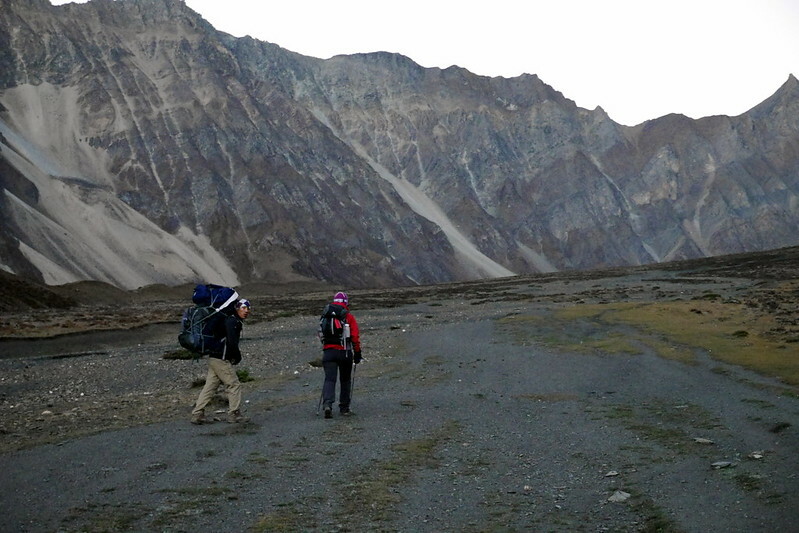 After all, tomorrow’s trek would take us up to the dizzying height of 5,320m as we crossed the Kang-La pass! These short hikes are a great way to prepare your body for the stresses of working in lower oxygen levels. 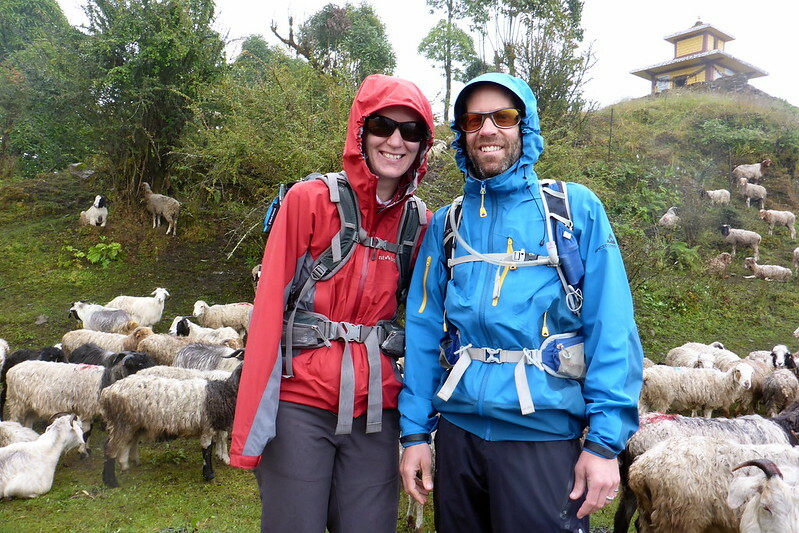 Of course, Deanna and I were ‘cheating’ just a little bit, as we’d opted to start taking Acetazolamide, a drug that helps speed up the body’s natural acclimatization. We really didn’t want to risk having a bad day up in the mountains! We only went up about 180m from Nar, but it provided great views over the village, and made for the perfect pre-supper activity. Little did we know when we set out in the early, very cold, morning, that this would turn out to be the single greatest day of our entire Nepal trip! We knew it would be impressive due to the surrounding mountains and the high pass we’d be crossing, but honestly, this was both humbling and flooring from both a scenery and effort perspective. It was a long day of trekking, and also involved a LOT of climbing followed by A LOT MORE descending. It’s safe to say that by the end of this day, we were completely pooped! 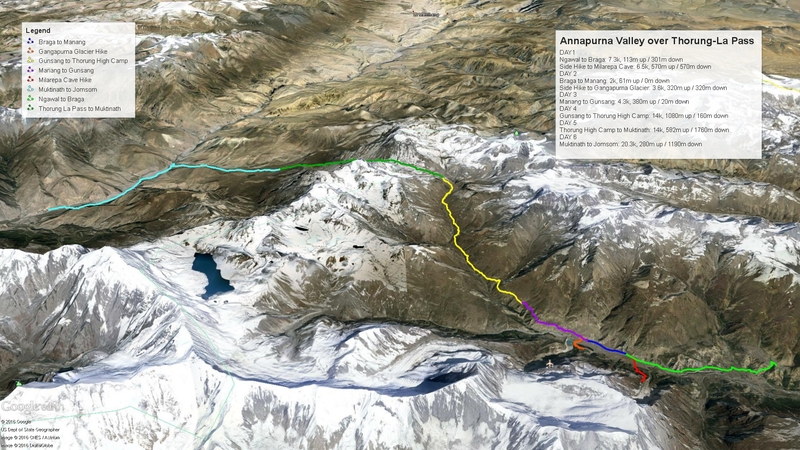 We started at 4,200m, climbed to a max of 5,320m, then descended all the way to 3,650m. The first 9.5k was all uphill, and the last 6.5k was all downhill, and VERY steep! Another thing we took the time to do up there was to undertake a typical ceremony, involving lighting incense, blessing a roll of prayer flags, and then laying them out up there. Deanna and I quite enjoyed this process, and were pleased to have our very new, bright colourful prayer flags join the many others that were already up there, but faded due to exposure. After finishing off our lunches and realizing we still had a fair ways to go downhill, we decided to head down. And boy, what a downhill! The trail down was initially very steep; scree jumping was the easiest option for the descent. After the scree, it was still pretty steep going, and we eventually made it to a plateau overlooking the peaks, which gave us a chance to rest sore knees and shaky legs. We were so shaky from the descent that we all collapsed in the grass, not caring much about the dried yak dung dotting the pasture! 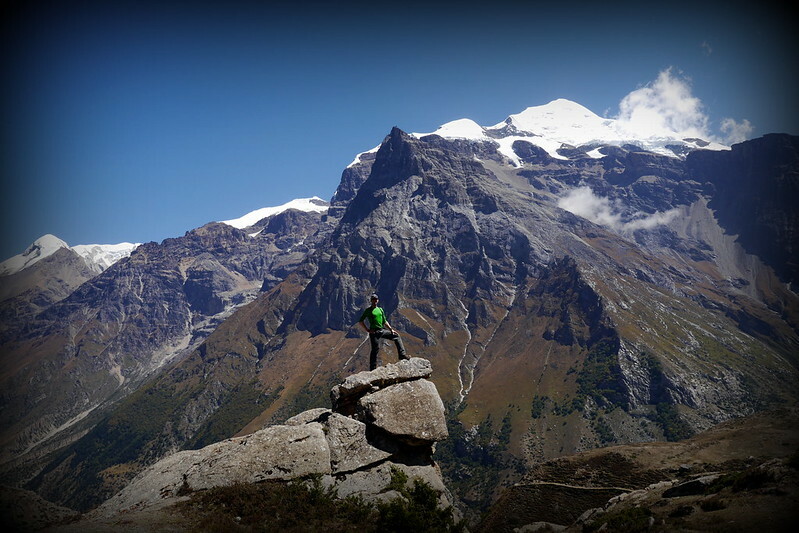 From here we would continue to contour the mountain to get to Ngawal, which is on the upper Pisang route of the Annapurna circuit (off the main Annapurna circuit). The walk down was very nice, and while we should have taken it really easy and enjoyed the views, we couldn’t help but to go pretty quickly. The end result were some very tired legs when we finally arrived at our guest house. But the day’s fun wasn’t completely over yet. After a nice little nap on arrival, I got up and did a little exploring around the village, and then, treated myself to some hot water for a mini shower! It had been a few days, so it felt quite heavenly. Not only that, but later on, I even managed to get some fresh popcorn and a beer! Yup, the day ended absolutely perfectly, and resulted in a perma-grin on my face for the rest of the day. 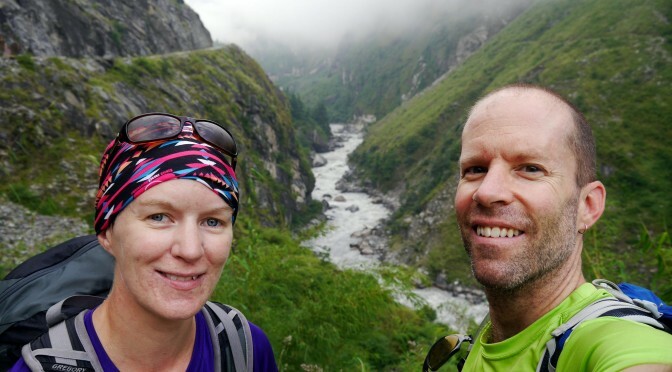 The next day, we’d be joining back up with the main Annapurna circuit, and start the next part of our trip, and climbing even higher to celebrate our 2 year anniversary! Stay tuned for that post next! 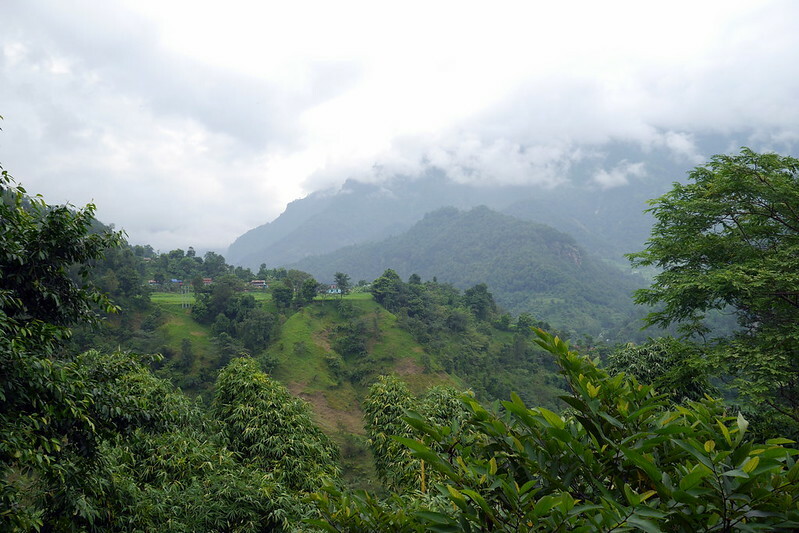 Nepal: Let the Trekking Commence! Howdy all! 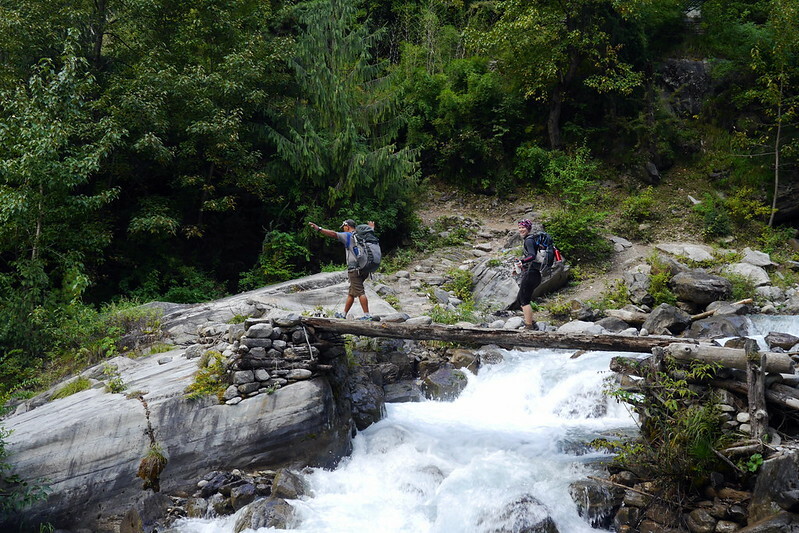 To work our way to the true ‘highs’ of the trip to Nepal, this post will now focus on the first few days of trekking. 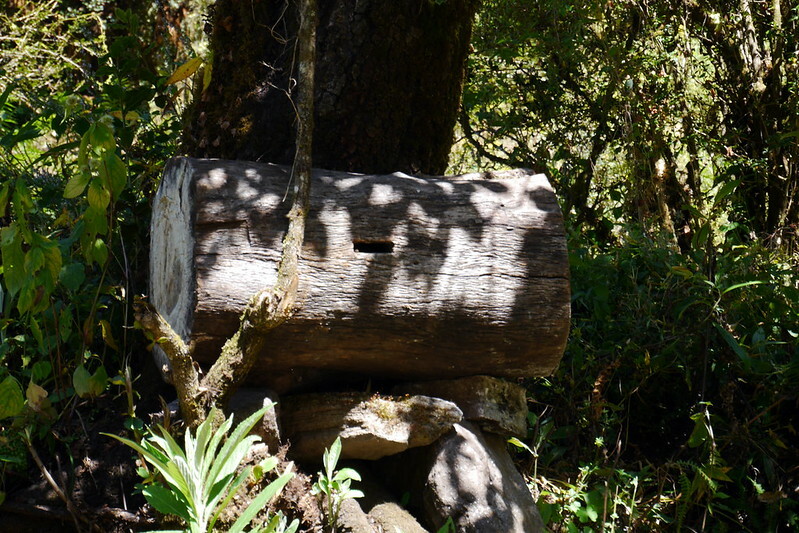 Well, actually, part of the post will focus on the DRIVE to get to the trekking, which was an adventure in itself! While I had hoped to share exact trekking maps for all parts of the trip, the first few days didn’t make it, as my GPS watch ran out of memory and overwrote the first couple days. Too bad, as one of them was a pretty good distance. At any rate, there are far too many stories to talk about EVERYTHING we did and saw along the trails, but the post should definitely give you a flavour of this section. 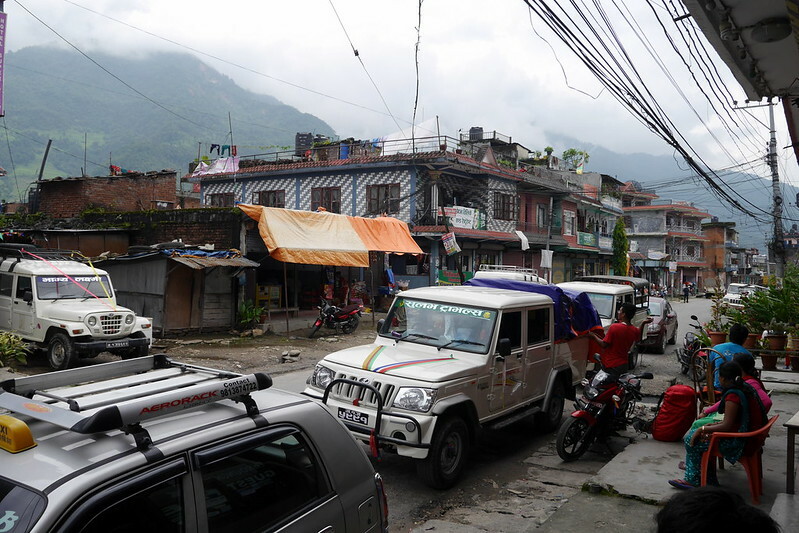 The next morning, after having supper at the tour company owners’ home the night before, we piled into a private car which was going to drive us from Kathmandu to a little village in the Annapurna region known as Besisahar. Before leaving the big city, our actual guide (Ram) and our personal porter (Purna) joined us for the ride. These two would be with us non-stop for the next couple weeks, so we hoped we’d all get along. For the ride, we did our best to start getting to know each other a bit, and also to try and figure out how their English skills were. I’m happy to report they had excellent english, and while things weren’t ‘perfect’ the entire way, we all got along very well and we’d definitely recommend them if you ever find yourself in Nepal! The drive to Besisahar, while only 175km or so, took well over 5 hours. Believe me when I say that even though you’ll see lots of roads on Nepali maps, they are not ‘western roads’. 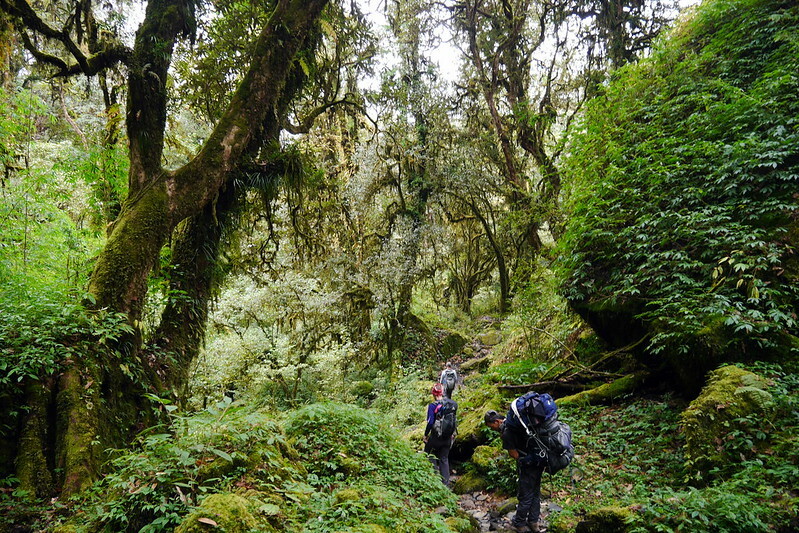 At any rate, once we arrived at Besisahar, we had our first ‘acclimatization’ hike as a group. I actually think it was more a case that our guide wanted to assess our fitness level. Fair enough. We passed. It was stinkin’ hot here, but with little to do in the small town, Deanna and I headed off on our own after this hike to do a little more exploring, ending up a fair bit downhill by a river. There, I collected my 2 stones that I intended to carry with me and eventually leave one at each of our two major summit passes. The plan was to overnight in Besisahar before hiring a 4×4 for the next days’ journey, which would take us to the start of the real trekking, which we were quite looking forward to. Clicking the link below will take you to the full album on Flickr, or you can scroll through the images here. Alright, so this day started with a pretty amazing 4×4 adventure. 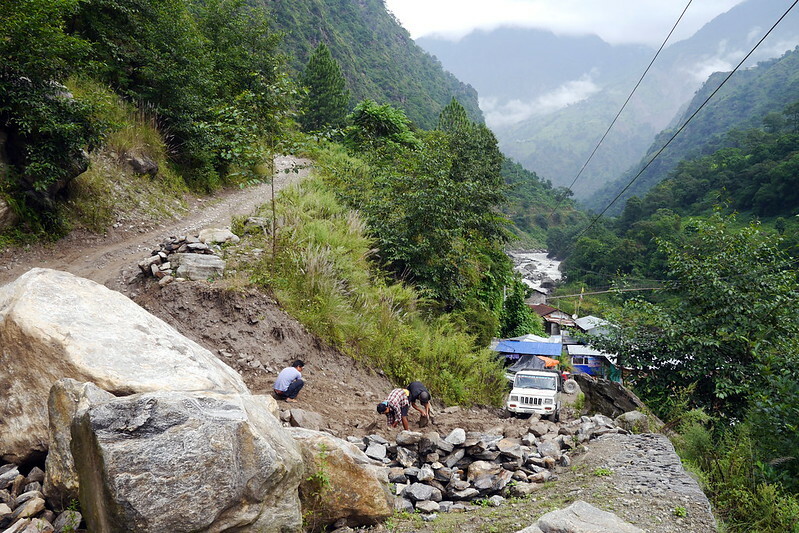 While a car had been sufficient to get us this far, our next ‘road’, which took us from Besisahar to Chamje, would require some heavy machinery. Although it was only 37km of road, this trip took us almost 4 hours! Ironically, people would pay a lot of money for the 4×4 experience we had, but for us, and the locals, this was actually more like the ‘taxi service’. It was amazing, with sheer drops on our side, deep mud to get through in parts, and even sections where we all had to get out so that the road could be ‘fixed’ on the fly by either adding or removing rocks / boulders! After this very impressive ride, we arrived in the tiny village of Chamje to enjoy our lunch before *finally* starting the actual trekking portion of the trip. We both opted to have some tasty curry dishes to energize ourselves. 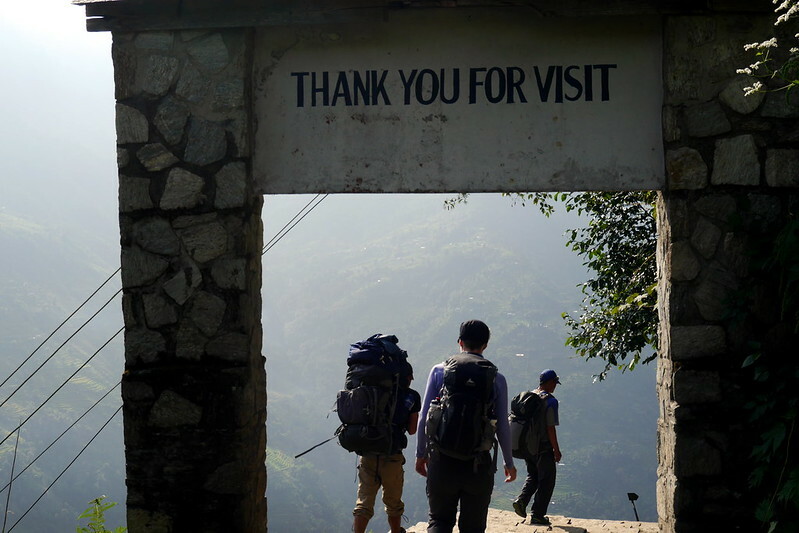 This is where we first noticed a funny etiquette point of utilizing guides / porters. Ram and Purna would take our orders and relay them to the restaurant owners, but would then disappear and leave us alone. Apparently, they are not supposed to eat with us. Over time, we convinced them to dine with us a couple times, but generally speaking, they would eat with the other locals in the kitchen, then rejoin us. They also wouldn’t get to eat until we were served. Lucky for them, they can eat really fast, so they were almost always ready to go before us. This first leg of trekking was relatively short and sweet. All told, we would be hiking less than 6km. However, given the jungle-like atmosphere, with heat and humidity, we were happy to not go too far on this first day. The journey took us along a very lush green valley. And when I say ‘green’, that involved a rather impressive marijuana field. Yes, I’m not kidding, we just trekked right through a weed field, and kept going! We also had our first experience with the local critters, including leeches that were all too happy to latch onto our heels / ankles (we each had a few). Later in the day, we also had a visit from a big spider in our room! We finished our day in the late afternoon, and had our first experience of staying in a proper ‘guest house’ or ‘tea house’. Essentially, along major trails, all the villages comprise of enterprising residents. Almost every home turns out to be a guest house, a restaurant, and a store! Very rustic, but very practical. You can always be guaranteed of finding a place to stay. The plus side of having a guide is that they know the ‘good’ places with the best cooks. Never mind that the menus are pretty much IDENTICAL everywhere, but they can still be better and worse. For our first night on the trail, we had the place pretty much to ourselves. We also learned on this day that once the day is done, there is very little to do, so we were glad we had Kindles, and feet to explore! The next day, after a simple breakfast, and the obligatory tea, which we had in quantity anytime and everywhere we went, we set off on our way to Koto. 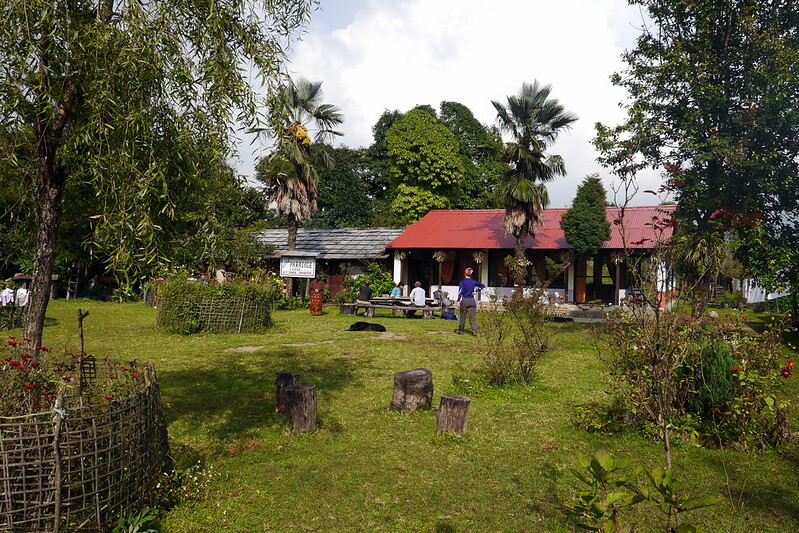 Originally, we had been set to hike from Besisahar, stop in Tal, then continue to a place called Dharapani, but we’d changed things on the fly due to Ram’s recommendation. What that ultimately meant for this 2nd trekking day was a nice long day of walking. Total distance was over 22km. While that sounds like a short distance to those who know the races I do, this was NOT a race. We were here to soak it all in and experience everything we could. The terrain on this day started out once again very lush and hot. However, over the course of the day, we climbed up from about 1600m in Tal up to 2600m in Koto, so the terrain did start changing a bit. While it was still predominantly green, I’d compare it to leaving a junglescape and making your way into more of a forest environment. The trail became more like a typical trail you might encounter on a wooded hike in the Rockies for example. Along the way, we stopped at an obligatory checkpoint in a village called Dharapani (where we had originally been slated to stop the day before). Interestingly enough, we happened to show up there on the exact date of the 36th World Tourism Day. We were also the first tourists through, so we were treated to a special little ceremony where we got scarves, and I even got a typical hat worn by locals. It was a pretty unique experience. After our little ceremony was completed, we carried on our way, with me feeling a little silly wearing the hat, but not wanting to appear ungrateful by taking it off. Our journey continued on along the road for a while before veering off into the woods once again. In order to make it to our lunch stop, we were now faced with a pretty steep climb straight up. I was loving it. The trail was a very impressive thing, with some sections actually more like a cobbled road, while other sections were really gnarly dirt tracks. Interestingly, these really aren’t just tourist tracks, but also a main way for local villagers to move throughout the valley. It was not unusual at all to bump into people along the way, and greet each of them with a warm ‘namaste’. It’s not just for Yoga over there, it really is the normal greeting. Today, like the day before, was not raining, but the skies were also not clear either. It was just a white / grey day overall. This prevented us from seeing any peaks in the region just yet, but we were pretty sure they would make an appearance in the next few days. After all, we were getting ever closer to the highest peaks! Our lunch stop was high up in the hills, and apparently would normally have a view, but instead, we just had a chilly light wind cooling us off up there. However, it was interesting as we learned more about how people live here. Most of the food you eat is basically whatever they have grown / raised on their own. Here, they had been drying out chili peppers and beans, to feed them over the next few months, along with other assorted vegetables. Everything is very fresh and tasty. To feel more like a local, our porter Purna and I spent some time foraging for food in the woods. Our prize? 40 walnuts that ended up being lugged across all the high peaks for the next 2 weeks, as I patiently waited for them to be dry enough to be ready to open. More on this in future posts ;-). With lunch finished, we carried on our way, navigating another mix of access roads and trails to finish off in Koto, another small village. 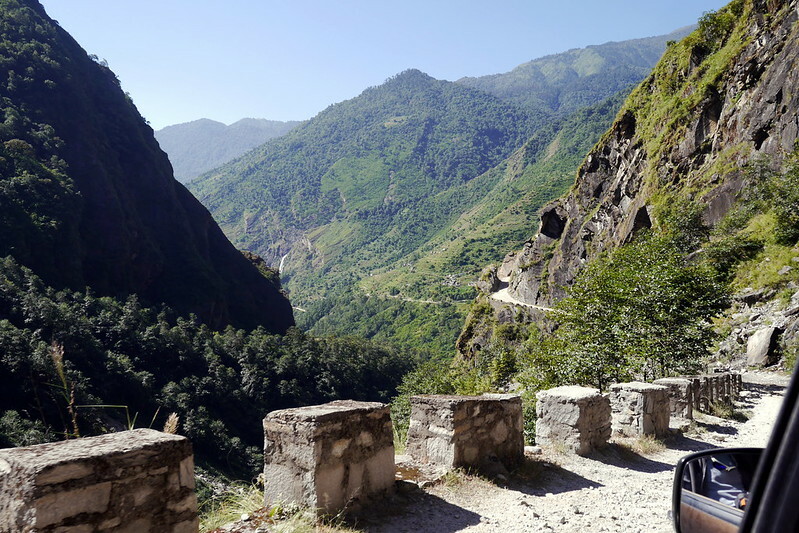 Most tourists continue up the road to a place called Chame. 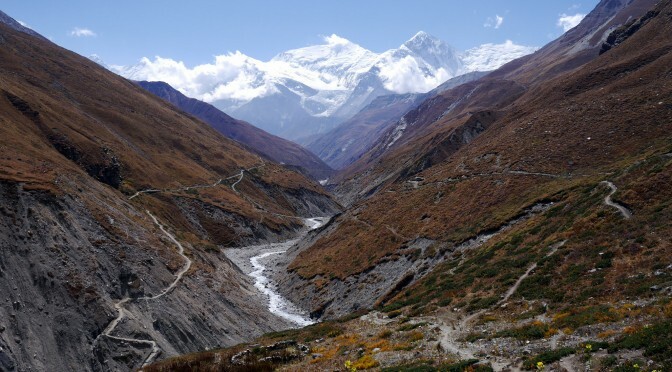 However, most tourists are trekking the normal Annapurna Circuit. We were about to start our own adventure in the Nar Valley, an area accessed from Koto, and only open to those with the proper permits and a guide. In other words, we’d be heading off the beaten path. As a result, in Koto, we were once again in a quiet town, although we did share our guest house with a few others. I also had access to some gas-heated water to approximate a shower of sorts. I cleaned up a little, knowing that it would be several days before we had that luxury again. To close out the night in Koto, I had a chance to try a local home-made alcoholic beverage. It’s name: Raksi. This is a distilled spirit made from millet or rice. It is also made by many of the guest house owners, if they have the time. It is cheap compared to bottled beers, but definitely an acquired taste. I eventually learned more about the process, and am curious to try and make it on my own some day, but I’ll need the appropriate pots to make a go of it. As there isn’t a lot of refrigeration around these parts, the drink was served at room temperature, and left a nice warm spot in my stomach. Well, there you have it. The first few days of the trekking. 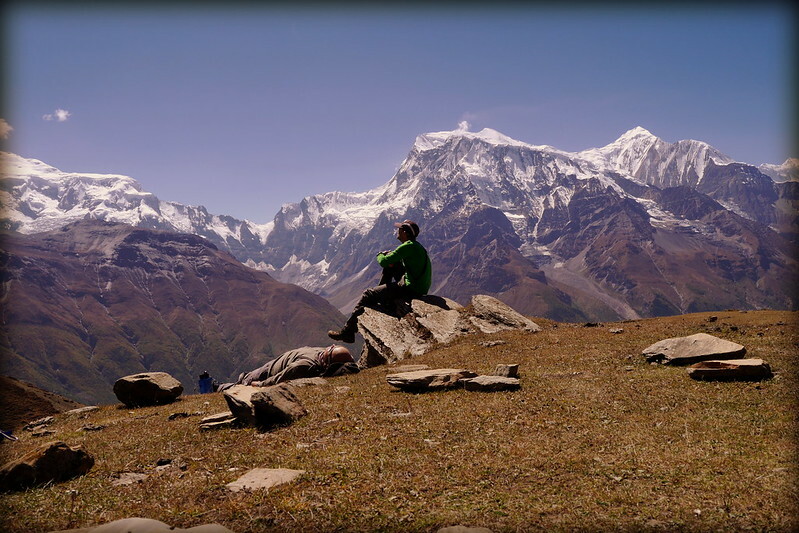 They really are the tip of the iceberg, but were a great introduction to the sublime pleasures of trekking in the Himalaya, and in the Annapurna region specifically. We were building up our ‘team spirit’ for the next few sections, as we’d climb higher and higher. Stay tuned for our next installment, where we’ll cross our first high peak! 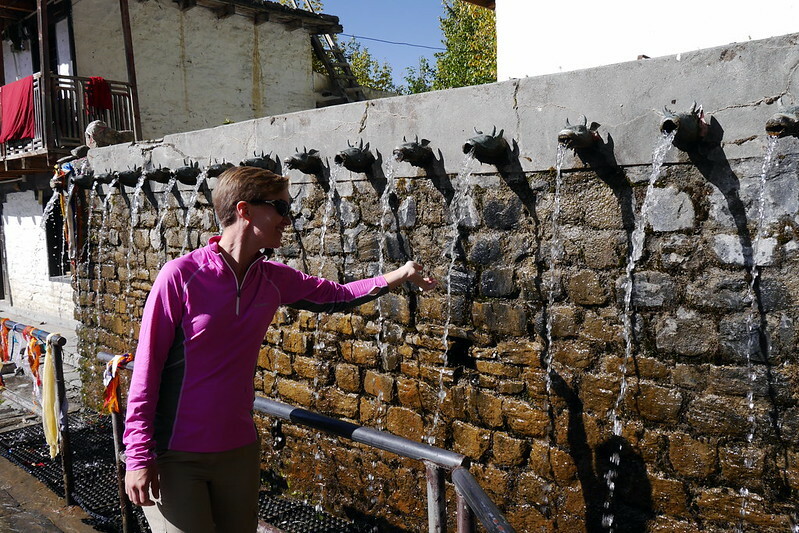 For now, this post signs off at 2,600m a.s.l with a smile on my face thanks to the hooch!